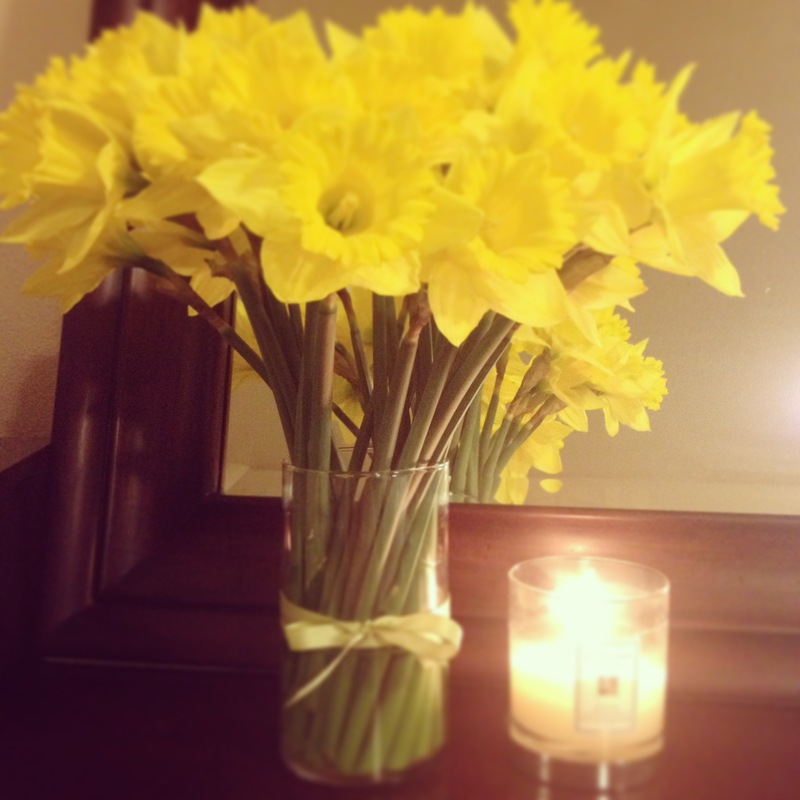 Happy (Good) Friday! I hope everyone had a fabulous week. It’s been in the 60s (SIXTIES!!) in Seattle this week, so it feels like spring is finally here. Between that and the upcoming Easter holiday, please forgive the fact that all of this week’s favorites are pastels and Easter themed. I bought myself a new Easter dress and some new Easter shoes (best part of the holiday! It’s as though I’m six years old) and am so excited for a gorgeous weekend full of celebrations – religious and otherwise. 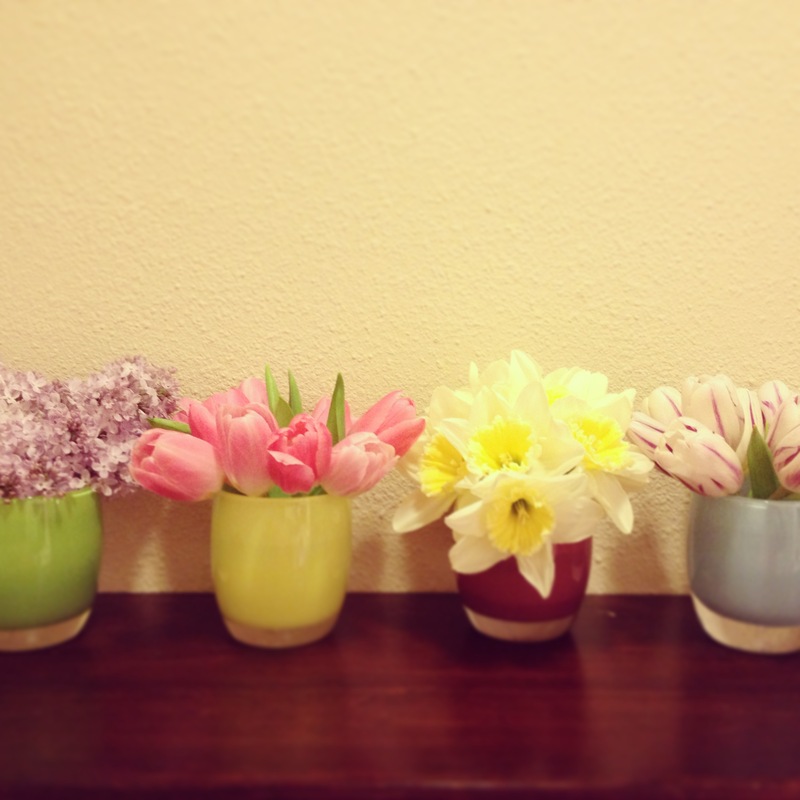 Way too much fun using my Easter pastels and spring brights as vases after I went a little crazy at the market. I’m making mini strawberry tarts for my cousin’s baby shower tomorrow…..it’s not really strawberry season yet but we’re so close! Le Panier is a French bakery in Pike Place Market….I took a little break from work the other day and found myself wandering through the market, and then somehow in line for macaroons. 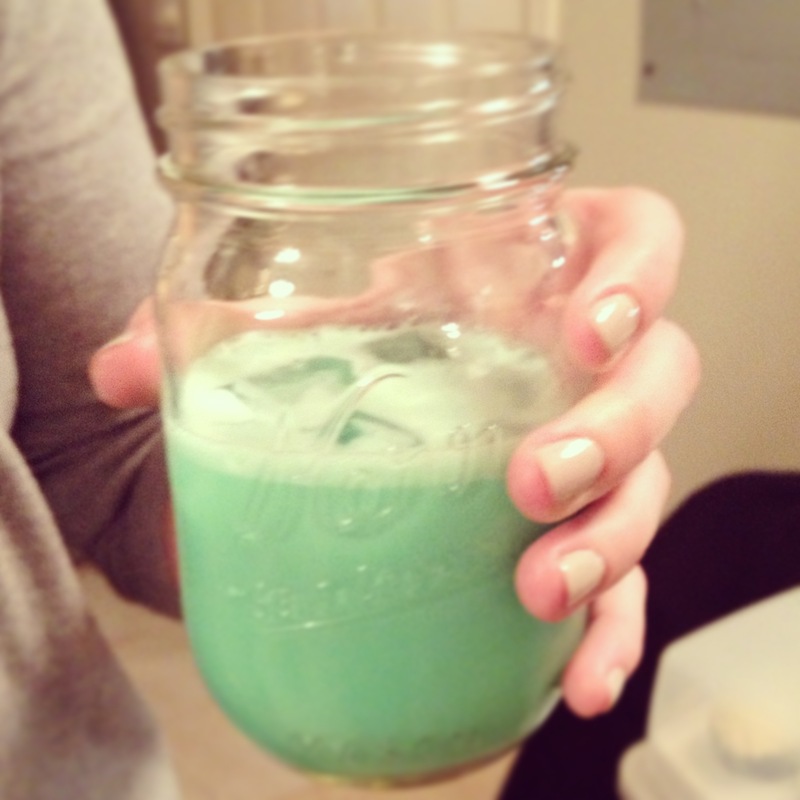 One of these days I’m going to teach myself how to make them, but in the meantime these are pretty perfect. 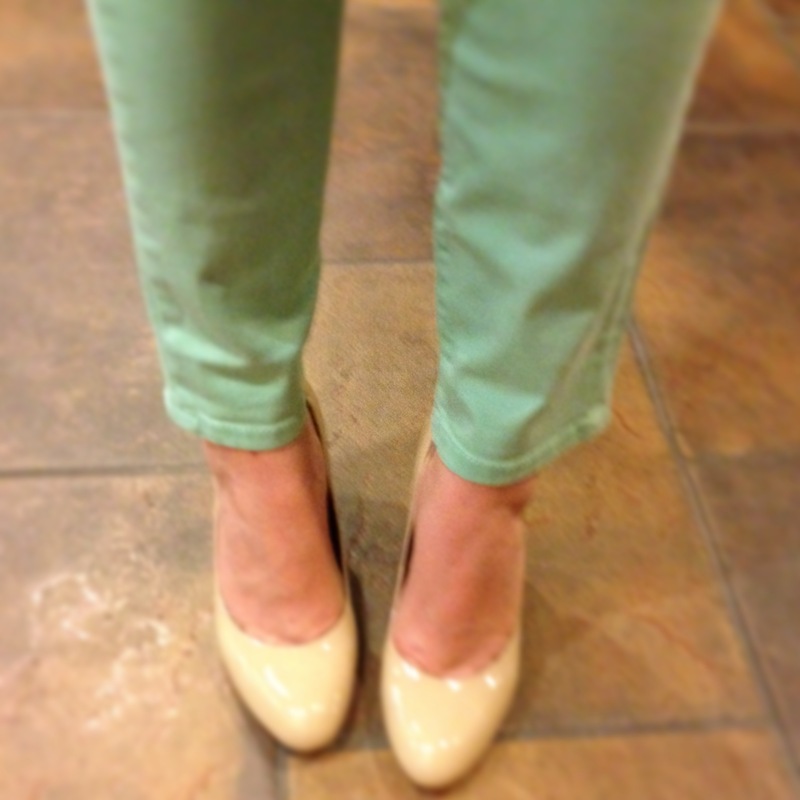 I was talked into these Joe’s jeans last week by my 93 year old grandmother, who informed me that “pistachio” is the color for spring. $69.99 at TJ Maxx, score!! 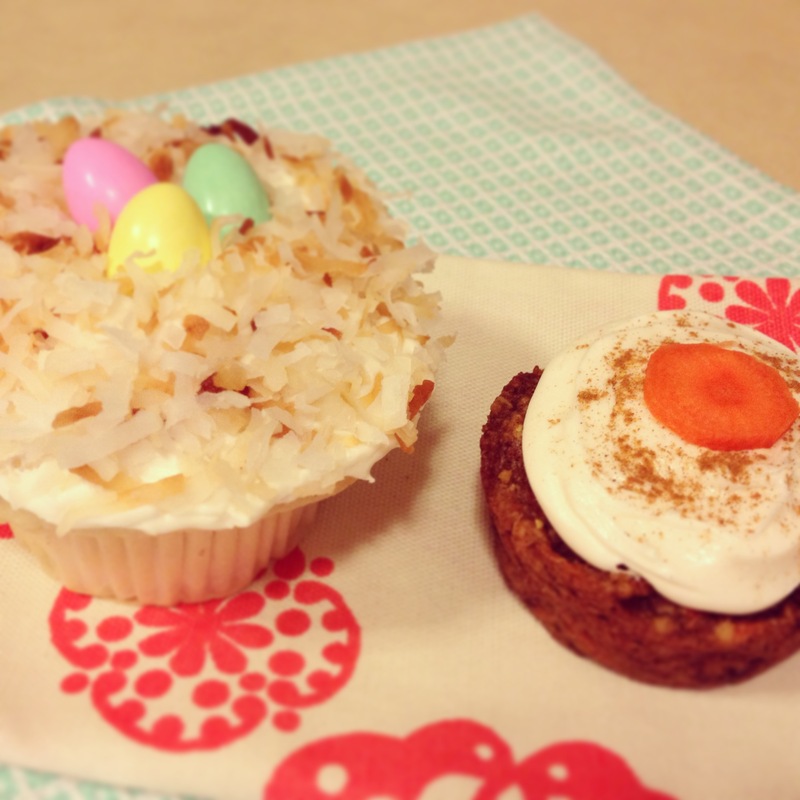 I couldn’t decide between my go-to favorite cupcake recipe (recipe here, boxed version here), or this much healthier – but also Easter-y – carrot muffin (recipe here). So I made both – something for everyone! 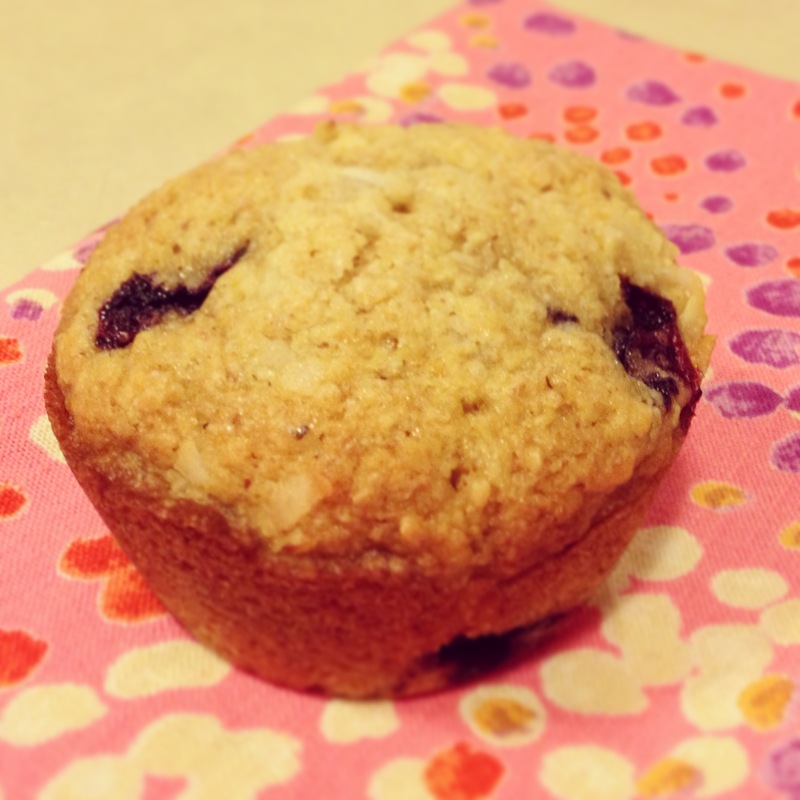 (Note: the carrot muffins aren’t your typical “cupcake disguised as a muffin” muffin – they are very much a muffin. And although the coconut whip is yummy, I actually prefer them without it). For the past few years, my friend Tracy has volunteered through the YWCA to put together a number of Easter baskets for children in the foster care system. She prices the baskets out, asks us all how many we’d like to donate, orders all of the baskets and goodies, and then hosts a brunch where we can all get together and put the baskets together over gossip and mimosas. Isn’t that one of the best ideas you’ve ever heard? 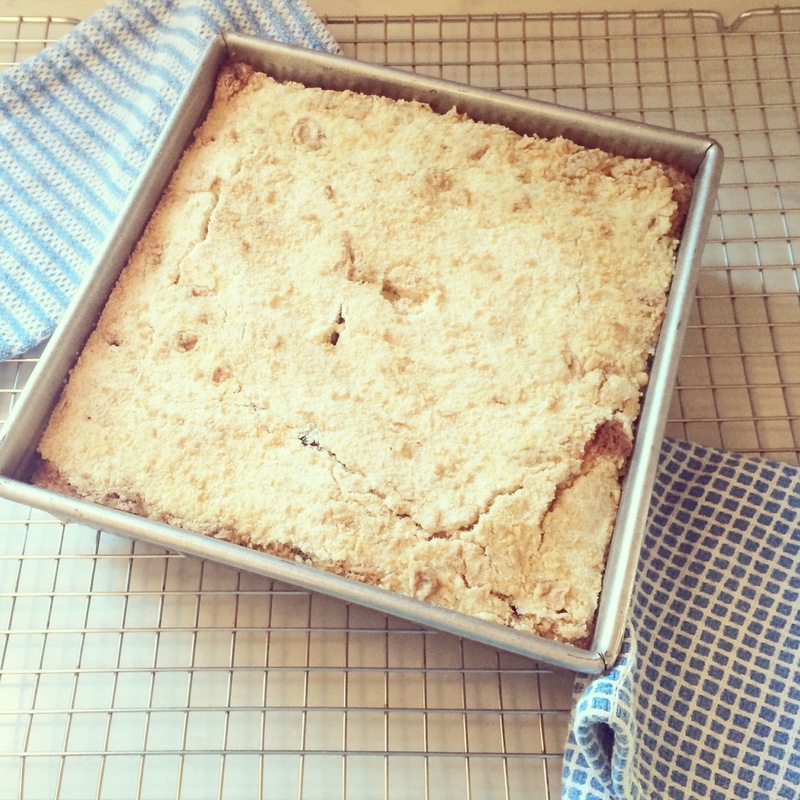 While it was pretty hard for me to get out of bed yesterday morning (since after the Zags’ loss on Saturday night my will to live was close to non-existent), once I did this coffee cake was easy to put together and bring to brunch (along with my heavy heart). And after coffee and two mimosas, I even started to feel just a tiny bit better. As you may already know from earlier posts, Smitten Kitchen is one of my very favorite food blogs, and when Deb released her cookbook last fall I was SO excited to see what it held in store for me. While I haven’t yet had the chance to make as many of the recipes as I’d like, those that I have tried (pancetta-white bean-chard pot pies and pumpkin-gingersnap-cheesecake tart, to name a couple of my favorites) have been pretty amazing. This “coffee cake” was no exception. I’m calling it a coffee cake, although Deb calls it a “butter cake” (whatever that means), and even goes so far as to include it in her cake chapter rather than her breakfast chapter, so that there’s no mistake. 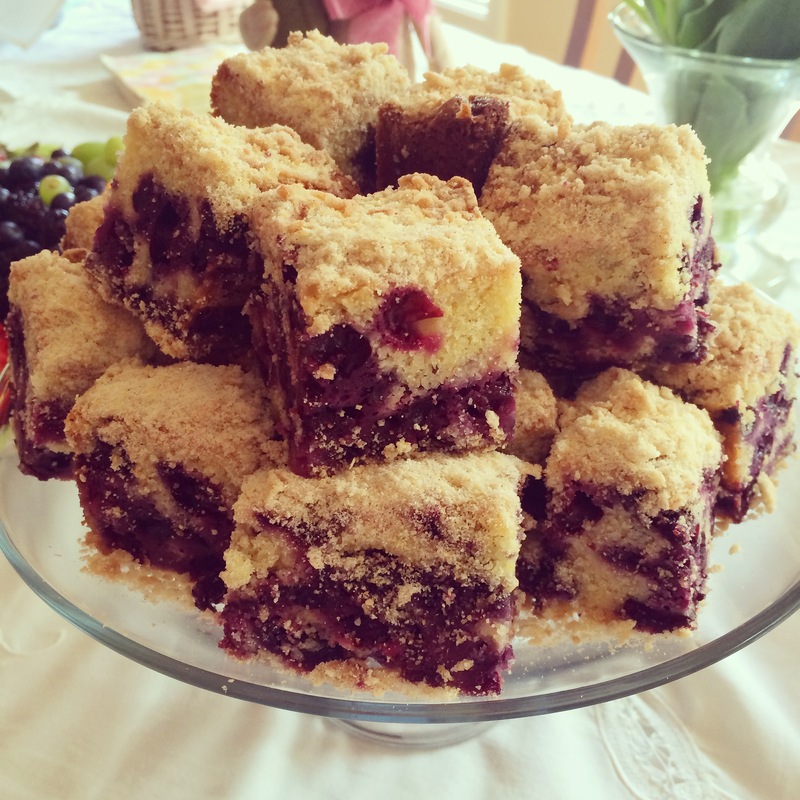 I happen to think the presence of blueberries automatically puts this in the breakfast category, so I’m sticking with coffee cake. If you’re in need of new ideas for your Easter brunch menu next week, I would really recommend that you try this. I was able to whip it up in about 15 minutes, and the 35-50 minutes it needs in the oven is plenty of time to shower, or set your Easter table, or in my case, go back to bed and squeeze your eyes shut and pray that somehow last night was just a bad dream. I should add that it’s not only easy, but delicious as well. It’s not too sweet (although I do think you could dial back the sugar in the topping if you wanted to), and the cornmeal is enough to make it interesting, and a little crunchy – but not so much as to make it cornbread-y. 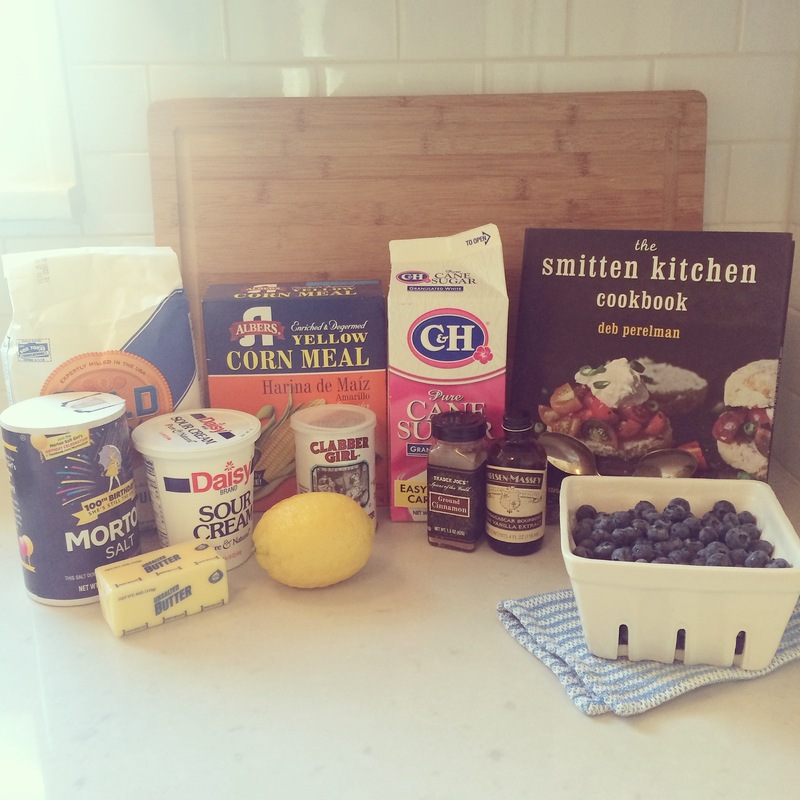 It’s pretty much a brilliant combination of a coffee cake, a blueberry muffin, and a light cornbread – and I suppose I can kind of understand why Deb calls it a butter cake, because it is pretty buttery (in the best sense of the word). It received rave reviews from all the girls at brunch, even the ones that wouldn’t normally eat cake for breakfast, blueberries or not. Preheat oven to 350 degrees. 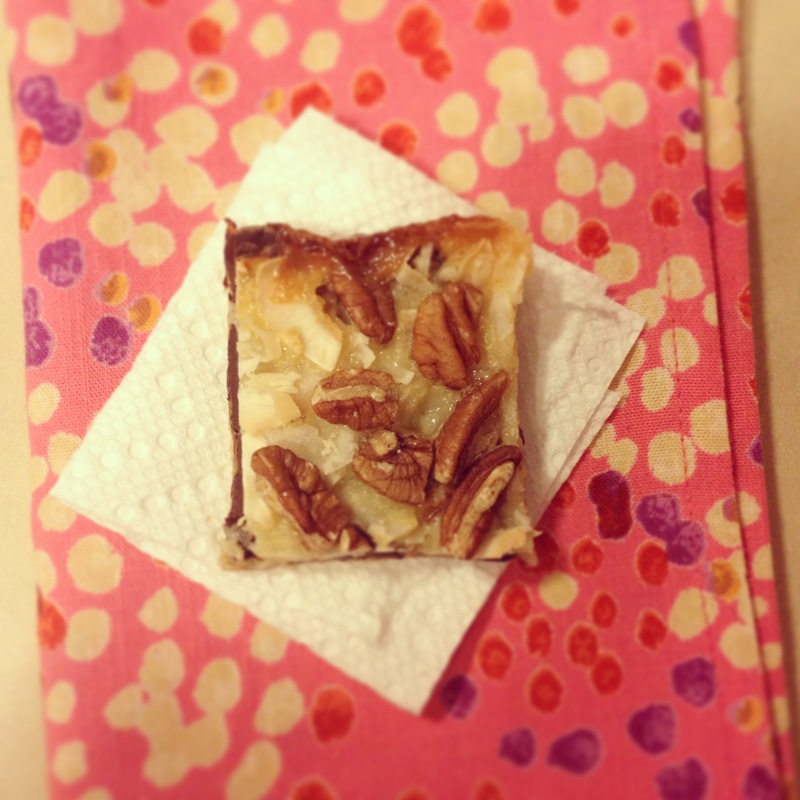 Line the bottom of a 8×8 square pan with parchment paper. Butter and flour the pan or coat with cooking spray. Whisk the flour, cornmeal, baking powder, and salt in medium bowl and set aside. 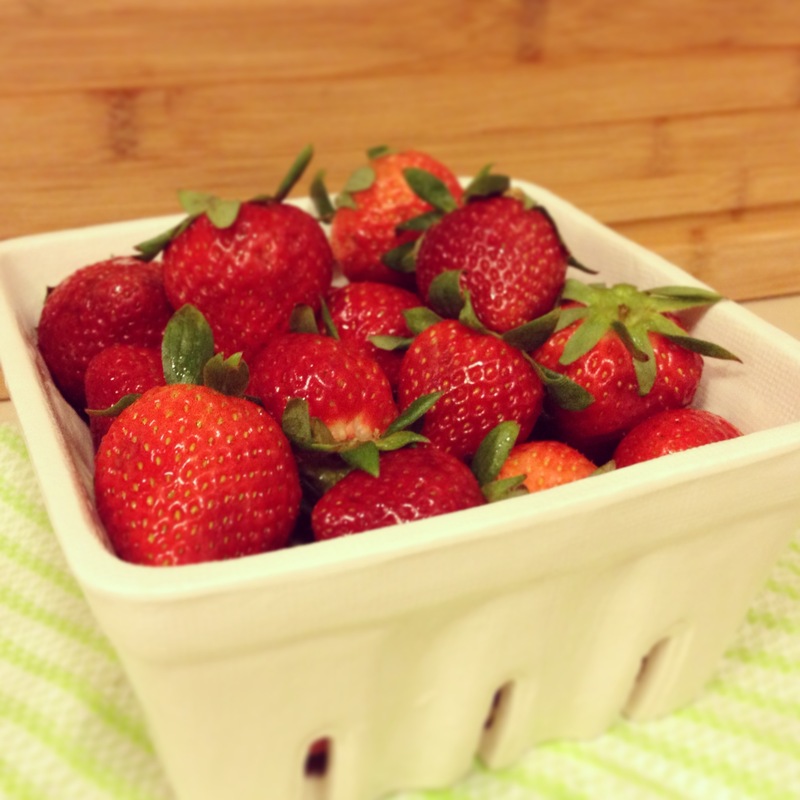 With an electric mixer, beat the butter and sugar in a large bowl until pale and fluffy, for at least 2 minutes. 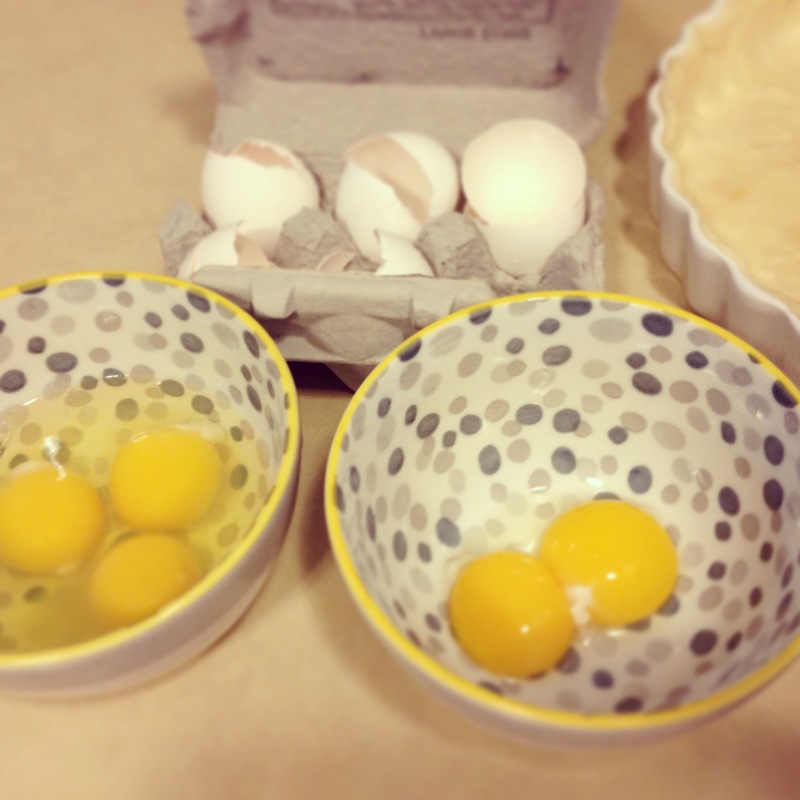 Beat in the eggs one at a time, scraping down the bowl in between additions, then add the vanilla and zest. Add a third of the flour mixture, all of the sour cream, and another third of the flour, beating until just blended after each addition. Scrape down sides of bowl. 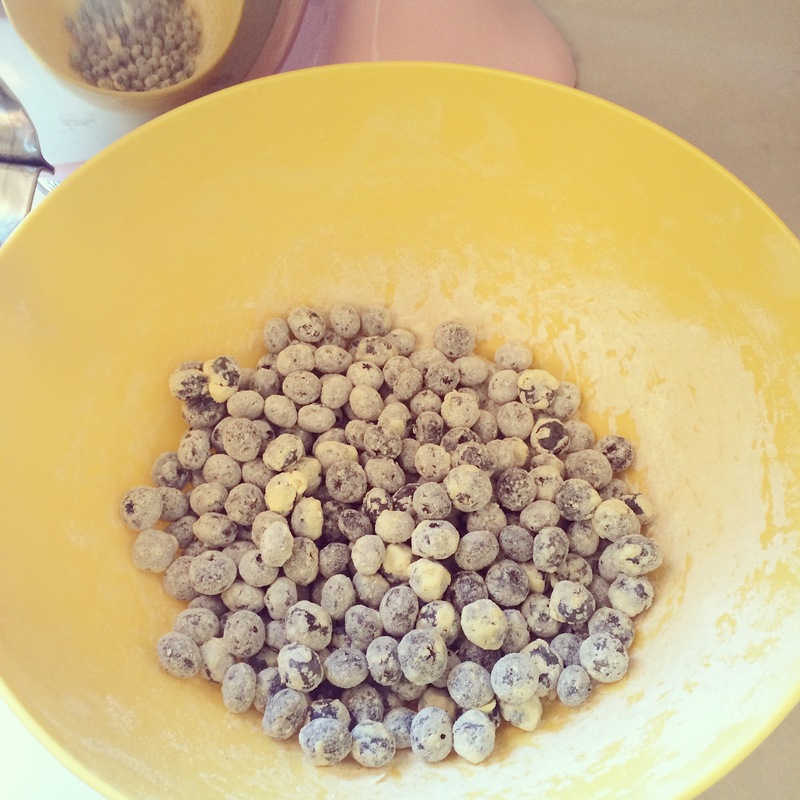 Mix the remaining third of the flour mixture with the blueberries. 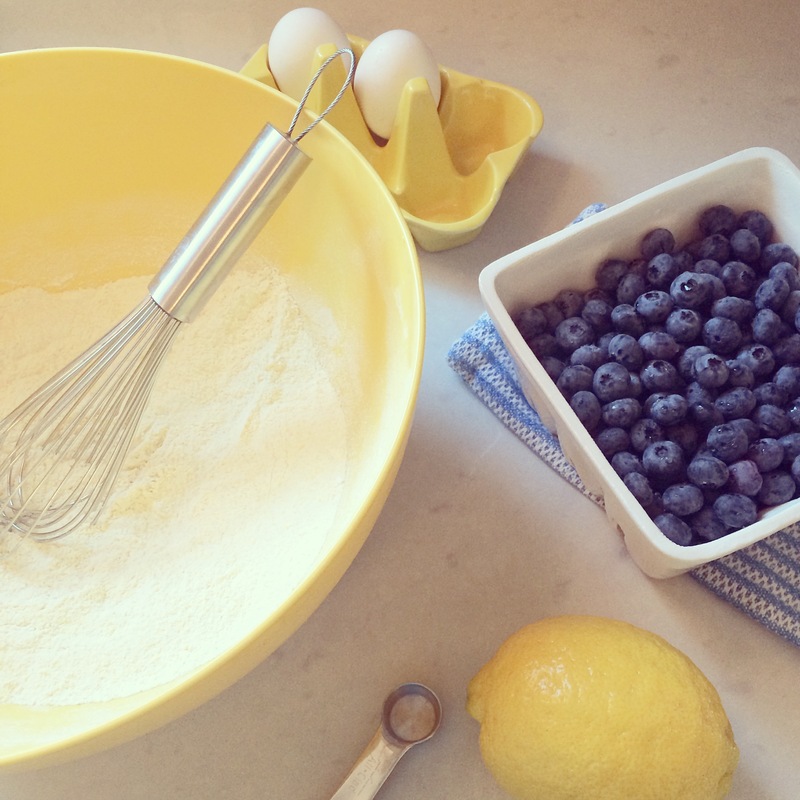 Fold the blueberry-flour mixture gently into the cake batter. 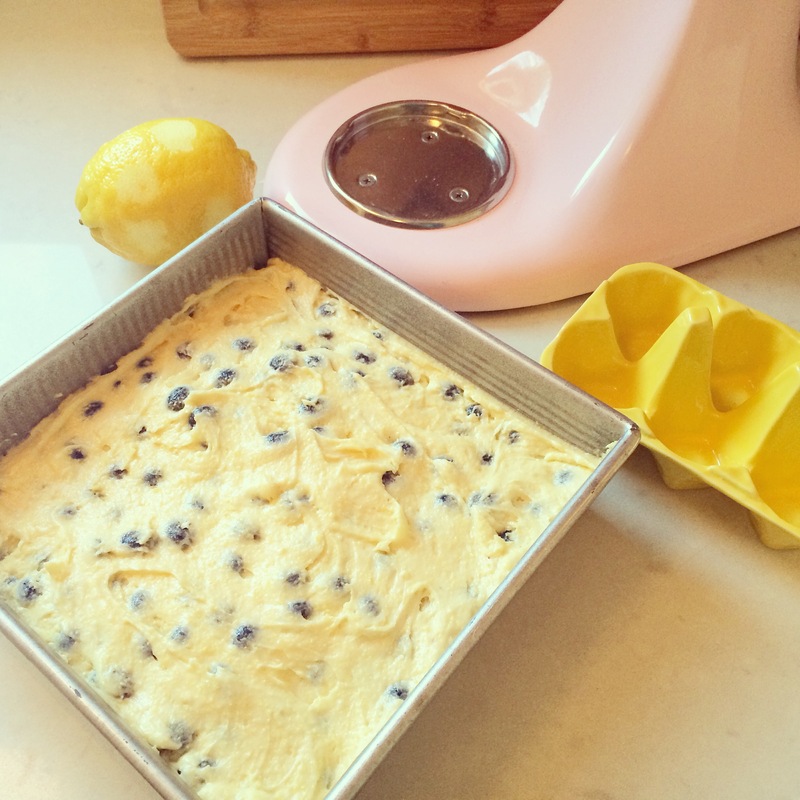 Spread the cake batter in the prepared cake pan. Use your original dry-ingredients bowl to combine the dry topping ingredients with a fork. Mash in the butter with a fork, your fingertips, or a pastry blender. Scatter the topping over the batter. Bake the cake until the top is golden brown and a tester inserted into center comes out clean, about 35 minutes (mine took 45 and the middle was still a bit undercooked). Cool the cake in the pan on a rack for 5 minutes. 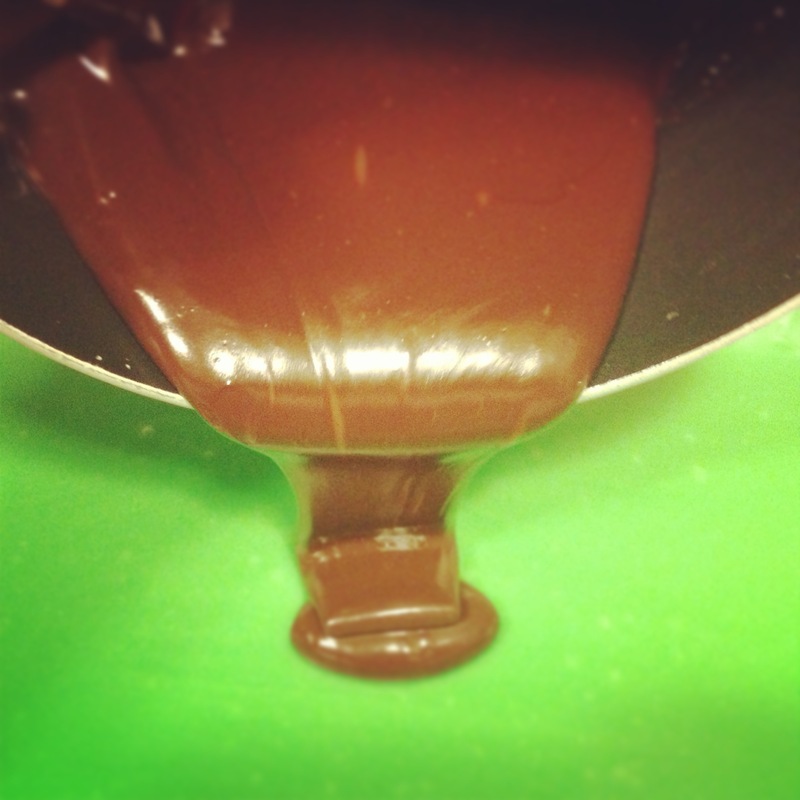 Run the spatula around the edges of the cake to loosen it, then flip out onto the cooling rack. I’ve never been much of an egg person, which I realize sets me apart from most people. I’m already unable to be a true foodie since I don’t eat red meat, but the egg thing means I don’t even have a go-to egg casserole recipe (and makes it really hard to eat anything besides mimosas pastries and/or fruit at brunch). 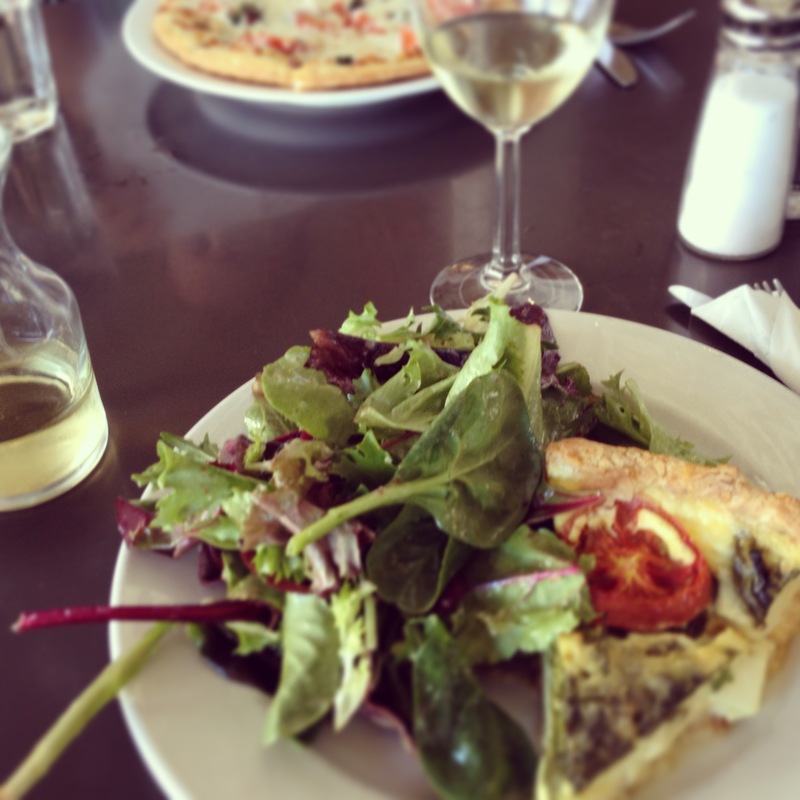 Up until recently I assumed my egg aversion equaled a quiche aversion, but when served a slice at a plated luncheon last summer I was forced to try a little bite, lest I risk revealing my unsophisticated palate to the room. And guess what? It turns out eggs, when mixed with cream and cheese and veggies, and baked in a deliciously buttery crust, aren’t so bad. 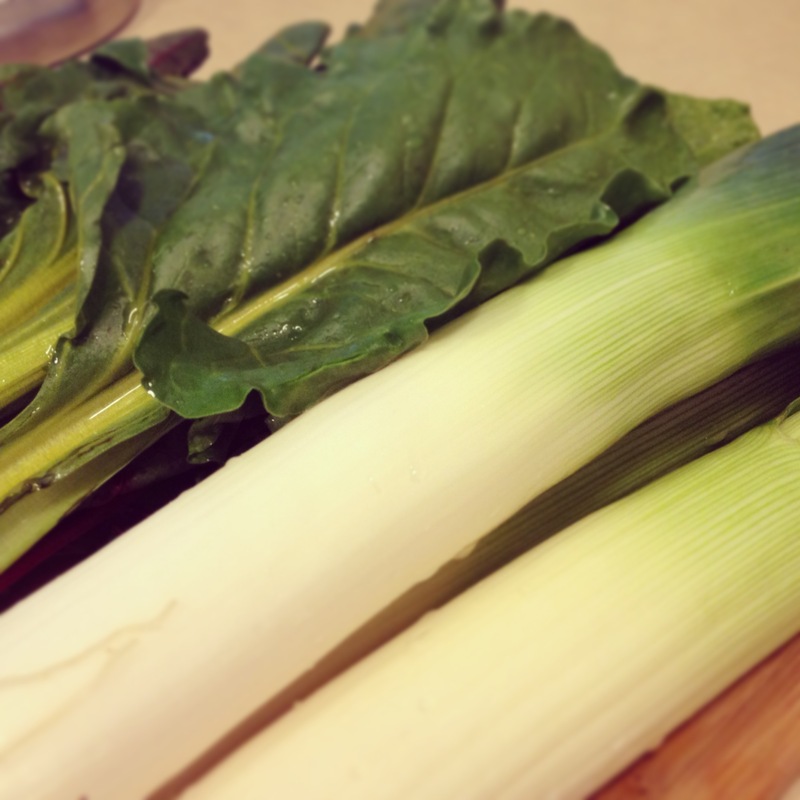 This leek and swiss chard tart recipe is incredibly easy – due in large part to the store-bought tart shell, but the veggies and custard aren’t at all difficult. Deb (from Smitten Kitchen) of course made her own crust, but I used store-bought per the instructions and it was just fine. I used an all-butter puff pastry (get a step above Pepperidge Farm if available), and the only thing I would do differently next time is to parbake the crust before adding the filling – the crust wasn’t soggy without par-baking, per se, but it wasn’t crisp. To parbake, place the crust in your tart pan (or quiche pan, or pie pan), poke holes in the crust with a fork, line the pan with buttered or oiled foil, fill with pie weights or dried beans or rice, and bake for 10-15 minutes. 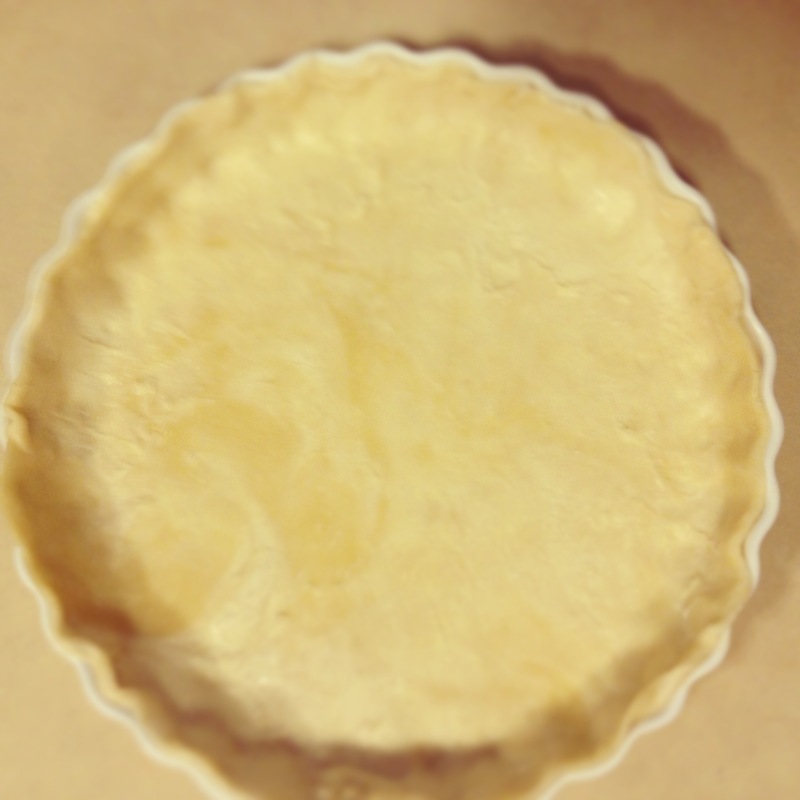 Then remove the pie weights and foil and bake the crust for 5-10 minutes more, until lightly browned. Remove from oven, add the filling, and then bake for 30 minutes as instructed. That’s what I’ll do going forward and I think it will help – but if you’re crunched for time, it’s not a necessary step. You could also make your own crust, like Deb, but who has that kind of time? Using a store-bought crust (or pre-made homemade, if you’re really on top of things), this could be an easy weeknight dinner. (Full disclosure: I actually think homemade crust can make a big difference, but when the recipe calls for store bought puff pastry I have no problem following those instructions. And I’ve never pre-made crusts and then stored them in my freezer…but maybe someday). 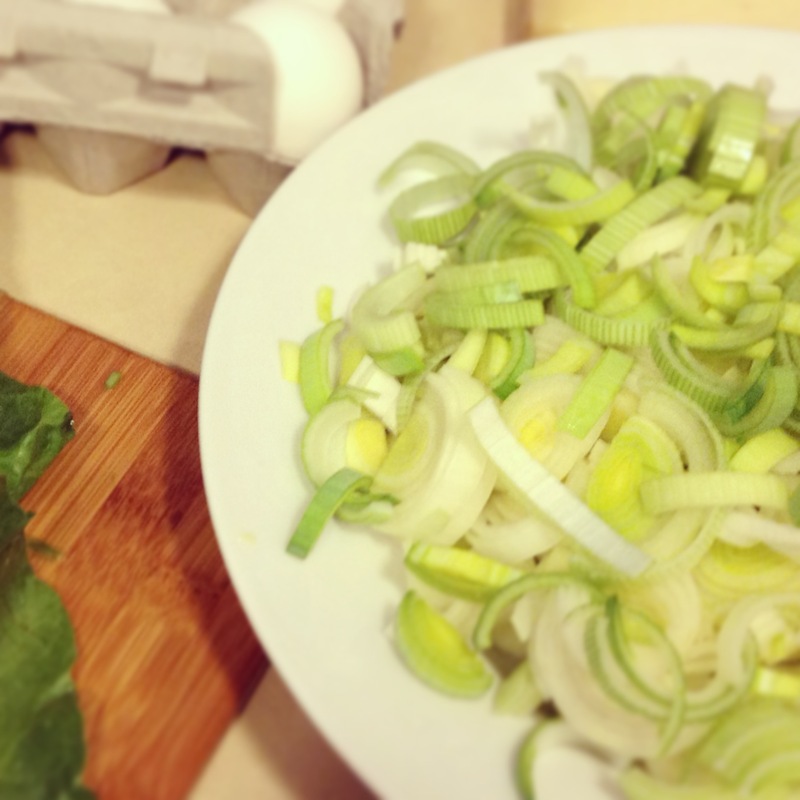 You can make a similar tart or quiche with any type of filling you like, but I think now is the perfect time to make this recipe, with the chard still in the markets as winter draws to an end, but the leeks representing the beginning of spring produce (I realize you can find leeks year round, but they seem springy to me). And with Easter coming up, and wedding shower/baby shower season about to kick into high gear, it’s a great dish to add to your repertoire. On a related note, does anyone know the difference between a tart and a quiche? 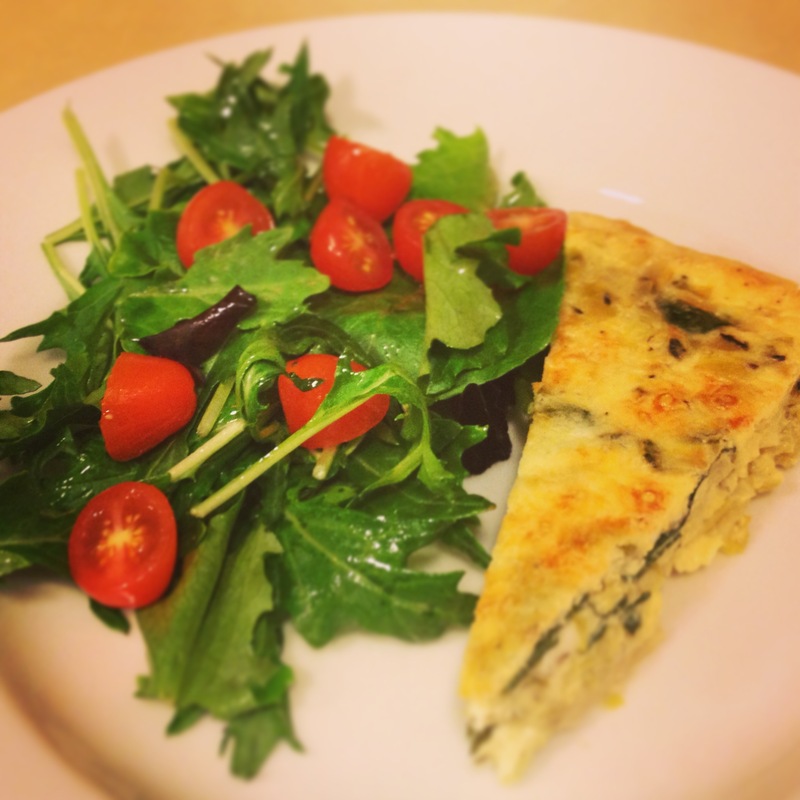 This recipe is technically a tart (per the name), but it seems a lot like a quiche to me, so I did a little google research. In case you’re interested, a tart is “an open pastry case containing a filling” (or “a promiscuous woman,” incidentally), whereas a quiche is “a tart with a savory filling thickened with eggs.” So, I guess technically this is both a tart and a quiche. Hopefully that clears up any confusion. 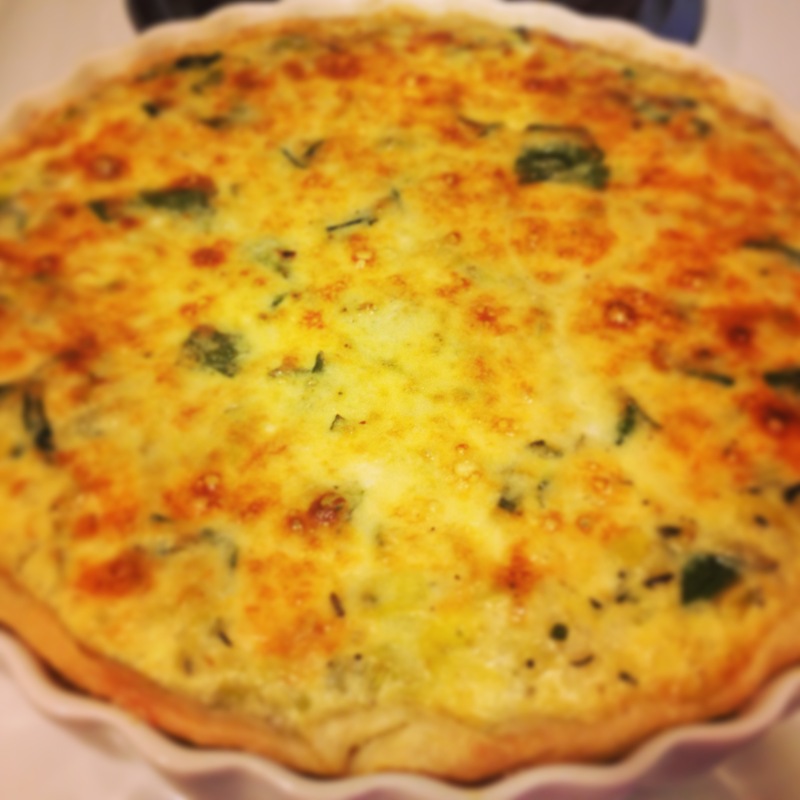 If anyone has a favorite tart and/or quiche recipe, I would love to hear it. 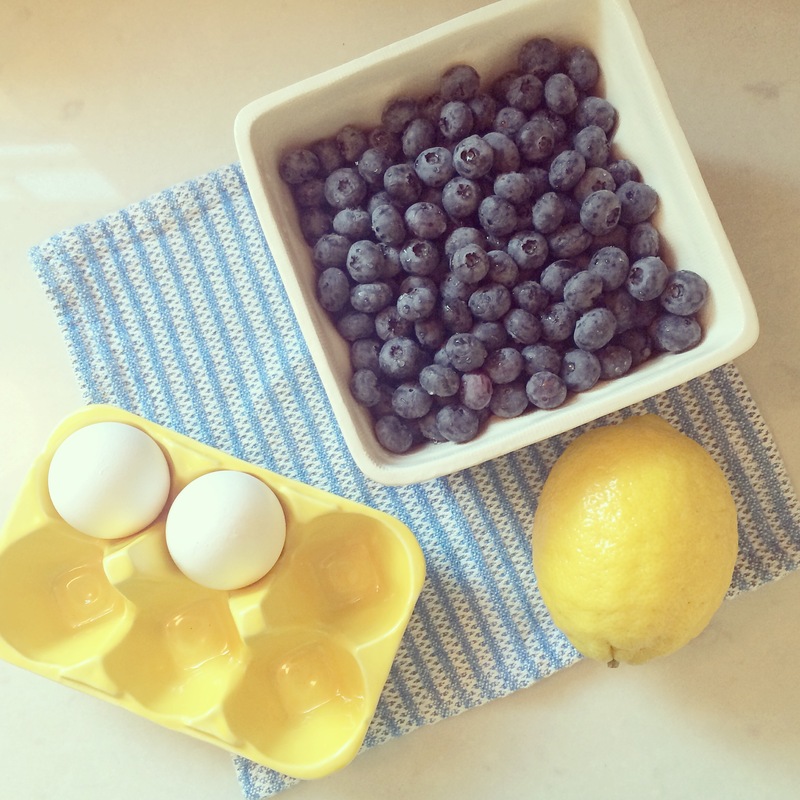 I bought some mini tart pans today and I’m pretty excited to make some non-quiche (egg free!) tarts, preferebly fruit filled. 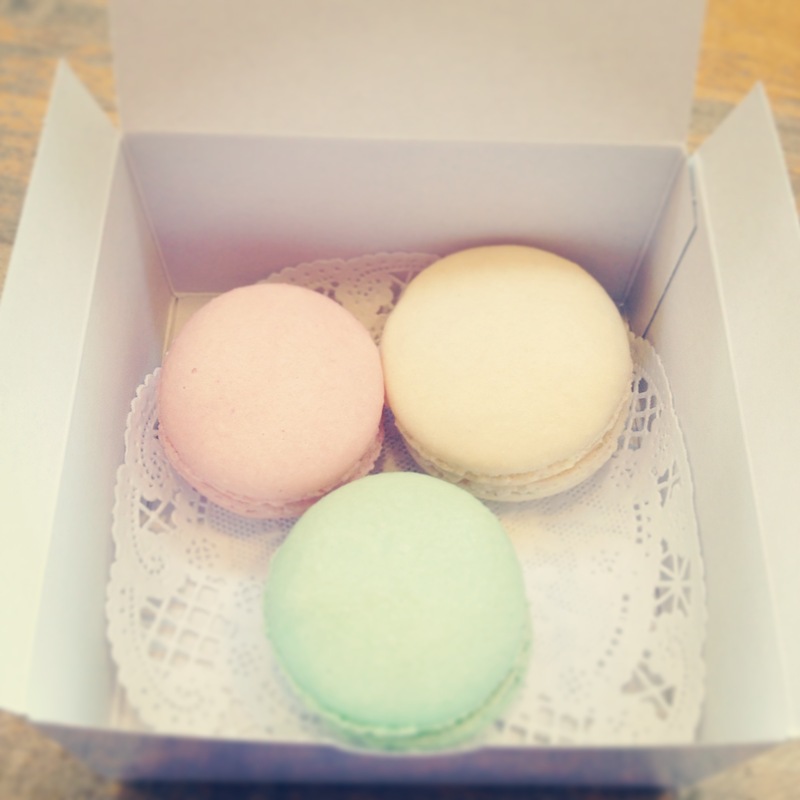 You know the kind with the glaze, in the pastry cases at French bakeries (and Whole Foods)? Bring on shower season! 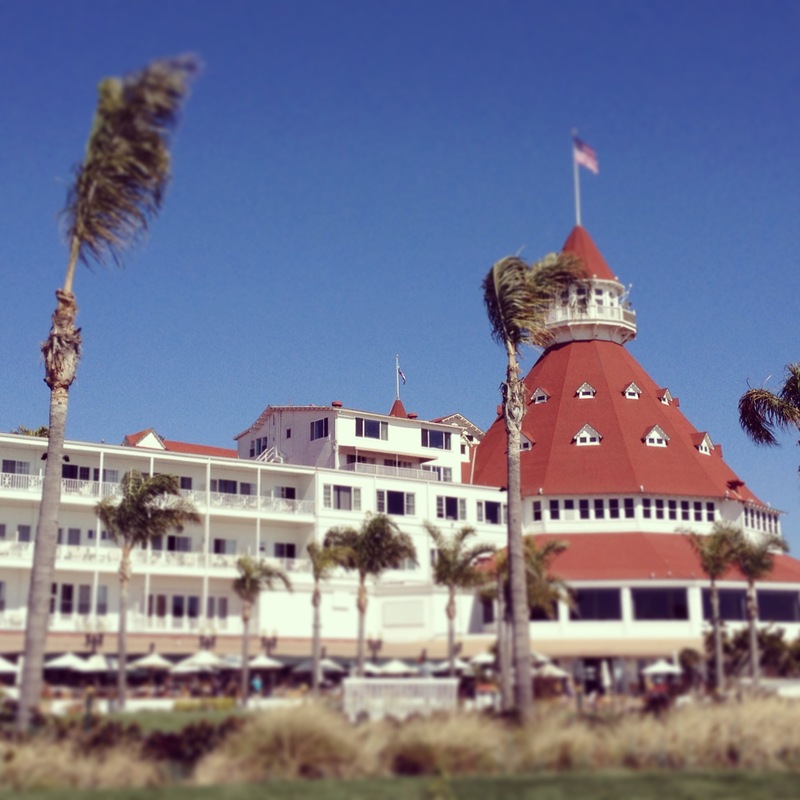 It’s hard to pick my highlights from the week, since on Wednesday night I flew out of Seattle (55 and rainy) and into sunny San Diego (blue skies and 80 degree temps). Icing on the cake (or rather, the cake itself, since he’s the reason for my visit – the sunshine is the icing), I got to meet my very dear friend Amanda’s 7 week old baby, Max. I only get to stay for a few days, so we’re going to pack in as many happy hours, beach trips, and Mexican food dinners as an infant’s schedule will allow. Luckily he’s one of the most easygoing babies I’ve ever seen, so that might be more than one would think. 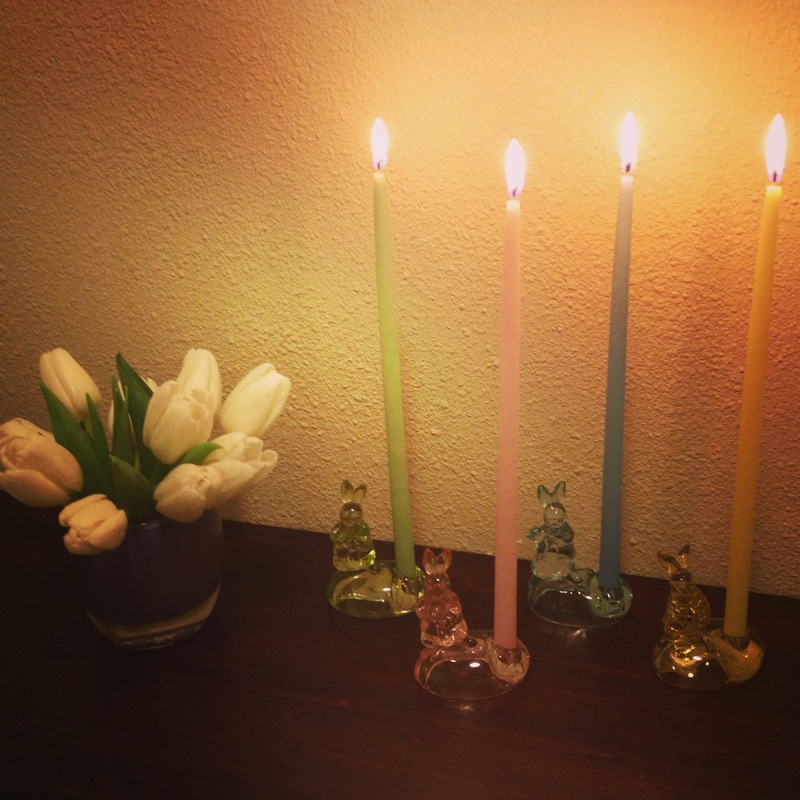 My idea of decorating consists mainly of changing out my Glassybaby displays for the seasons and holidays. 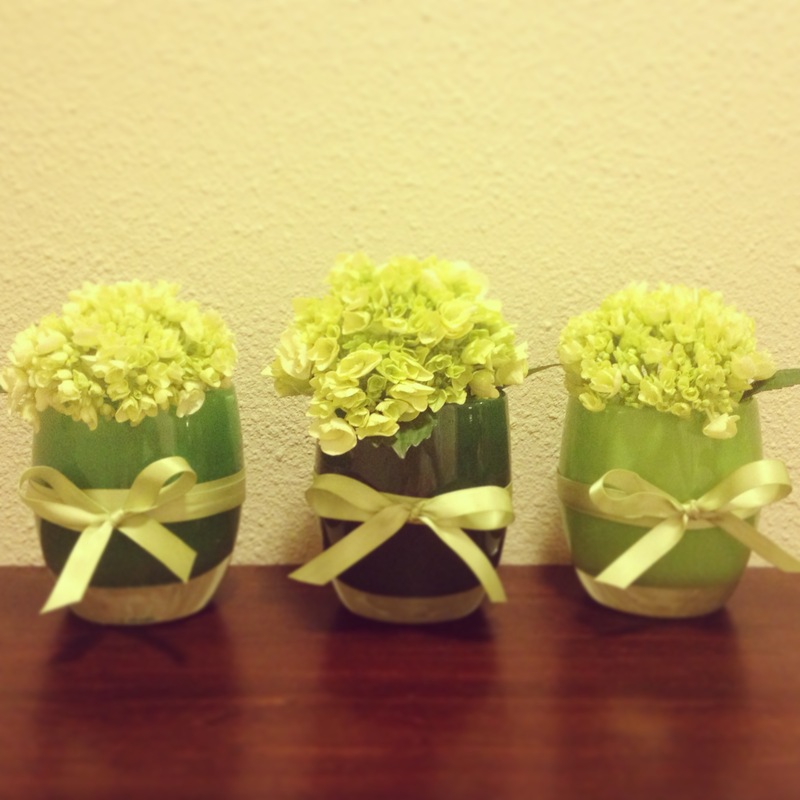 I love this St. Patty’s Day trio with the mini green hydrangea (at least that’s what I think they are). Technically two of these are “Christmas greens” – Elf was a birthday gift from my friend Kelly and Mistletoe I bought as a gift for someone else, but accidentally kept for myself. Oops! (Grass was a “thanks for helping with my wedding” gift from my cousin Anna). Last year they had a color called “Leprechaun” that I meant to get and didn’t, and now they no longer carry – but I think I need to add Emerald and Lucky to my collection for some true St. Patrick’s Day greens. I bought a loaf of soda bread from a bakery near my house last March, and it was so delish that this year I was inspired to make it myself. I know I said I would stop with the Melissa Clark recipes, but I guess I meant after just one more. 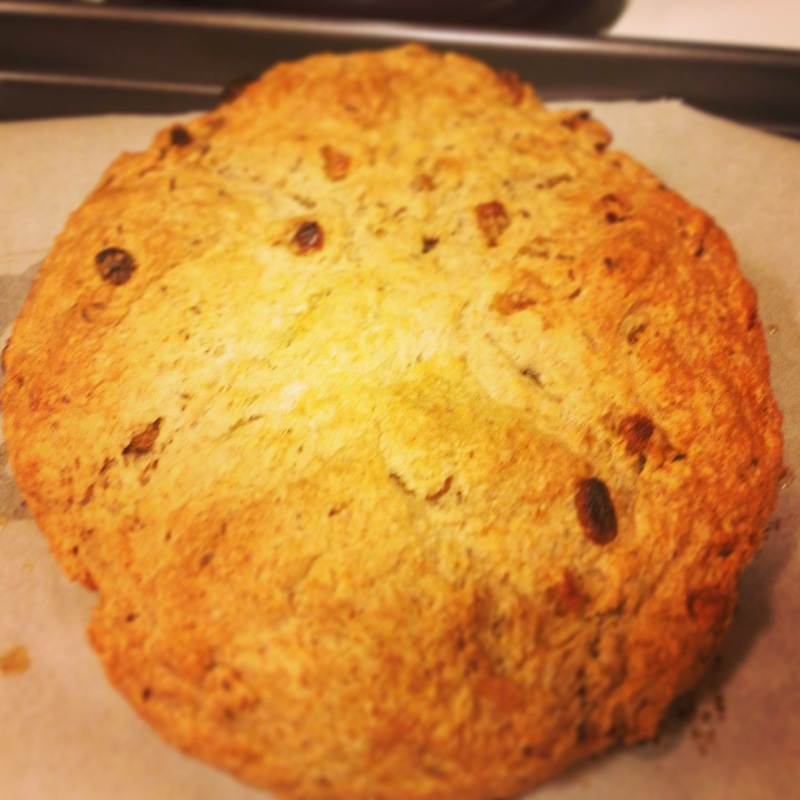 This one is so easy and so good – and if you’d like a more detailed explanation of soda bread, with better pictures, the recipe I used is almost identical to this one. The only differences are mine uses half the sugar, yogurt or sour cream rather than buttermilk, and part whole wheat flour rather than all white – but you could play around with the recipes and use whatever you have on hand. 1. Preheat the oven to 350 degrees F. Lightly grease a 10-inch round cake pan (I just used a cookie sheet with parchment paper). 2. In a large bowl, combine the flours, sugar, baking powder, salt, and baking soda. In a separate bowl, whisk together the yogurt, eggs, and 2 tablespoons of the melted butter. Fold the wet ingredients into the dry until just combined, taking care not to overmix. Fold in the raisins and caraway seeds. (Note: I had to quasi-knead the dough with my hands to get it combined, so it felt as though I was certainly overmixing, but my loaf still turned out great). 3. Scrape the dough out onto a lightly floured surface. Shape the dough into a round about 7 inches in diameter (it will spread to about 10 inches) and place it in the prepared cake pan. Score the round with a cross and drizzle with remaining 2 tablespoons of butter. Bake until golden brown, 45 to 50 minutes. Serve warm if possible, or toast slices before serving. Note: if you can’t find whole wheat pastry flour (I’ve never been able to, although I suppose I haven’t looked that hard), Melissa suggests using half whole wheat flour and half white – that’s what I did and mine turned out perfectly. I popped into J. Crew on Tuesday in search of some warm-weather pieces for San Diego, and found another sale going on. 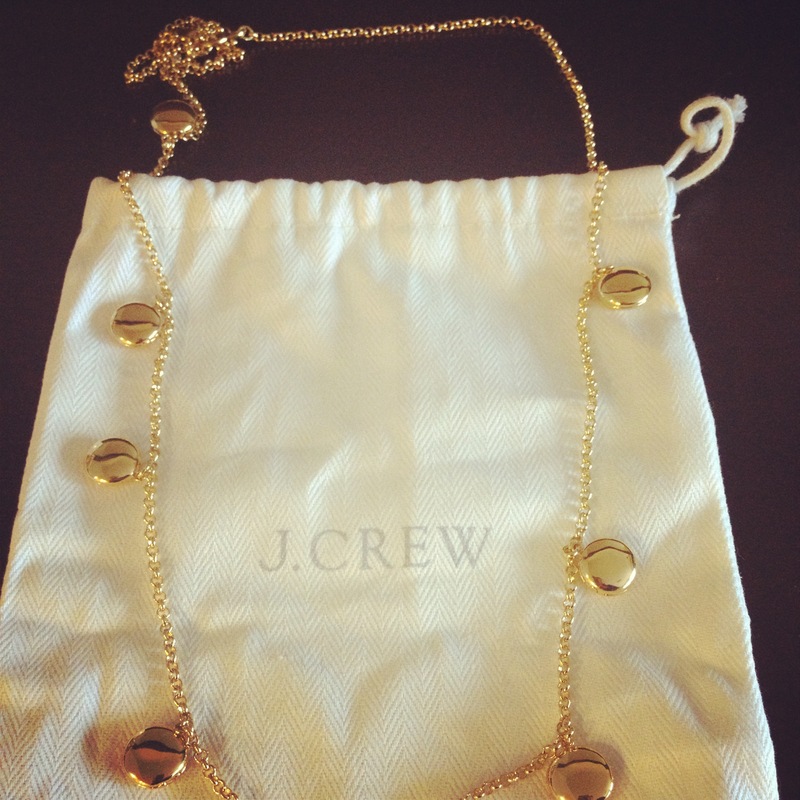 This locket necklace was 40% off final sale – originally $48, and I paid $17. 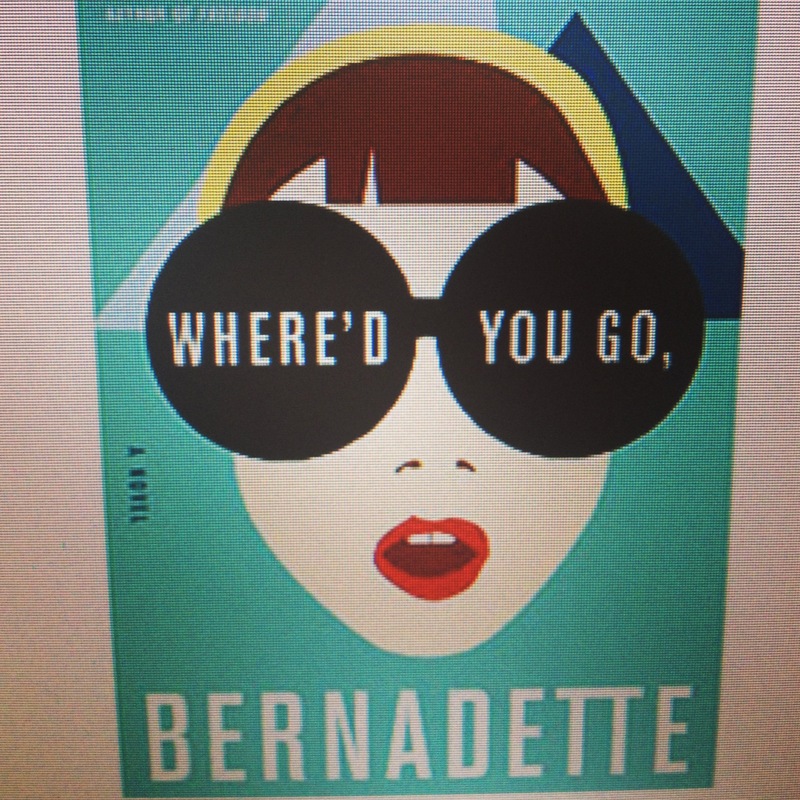 The little lockets all open up and everything – if only I had eight tiny little pictures. Yesterday Amanda, Max and I had an amazing lunch at Tartine, a delicious French bakery “on the island” (that’s what locals call Coronado:)). 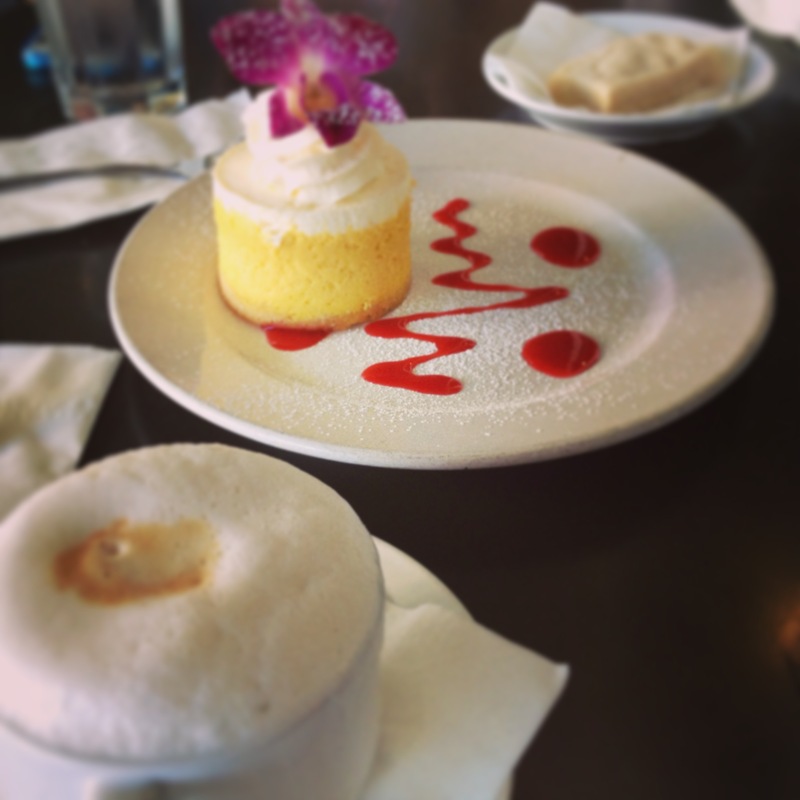 I had an amazing spinach quiche, and then we split a mango cheesecake for dessert. I wish it could be vacation every day! 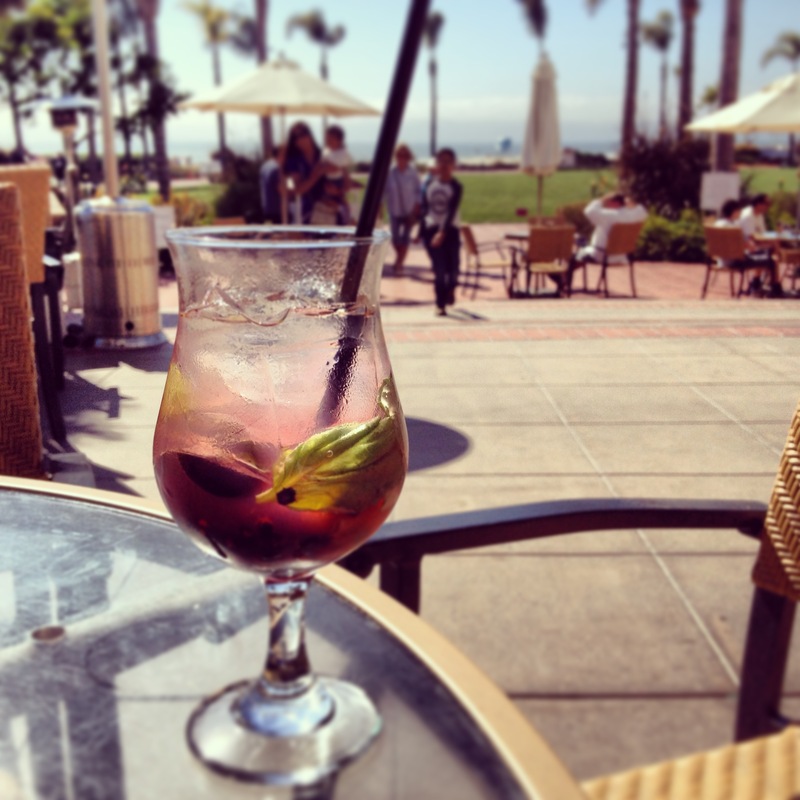 After lunch, we headed to the Hotel Del Coronado for an early happy hour. When I saw a drink called “blackberry basil” on the cocktkail list, I had to try it. If only it had been blueberries instead! It was to die for, and I think I might have to start putting basil in all my drinks now! I hope everyone has a fabulous weekend, wherever you may be! TGIF!! I wish I could tell you that corned beef and cabbage is a family tradition, but truth be told I’d never actually had it until Friday. I’m pretty sure my grandma makes it every year, but somehow I’ve managed to avoid that dinner because honestly, could anything sound less appetizing? Technically, I’ve still never had corned beef (and never will), since I don’t eat red meat, but I did try the cabbage and it was delicious. 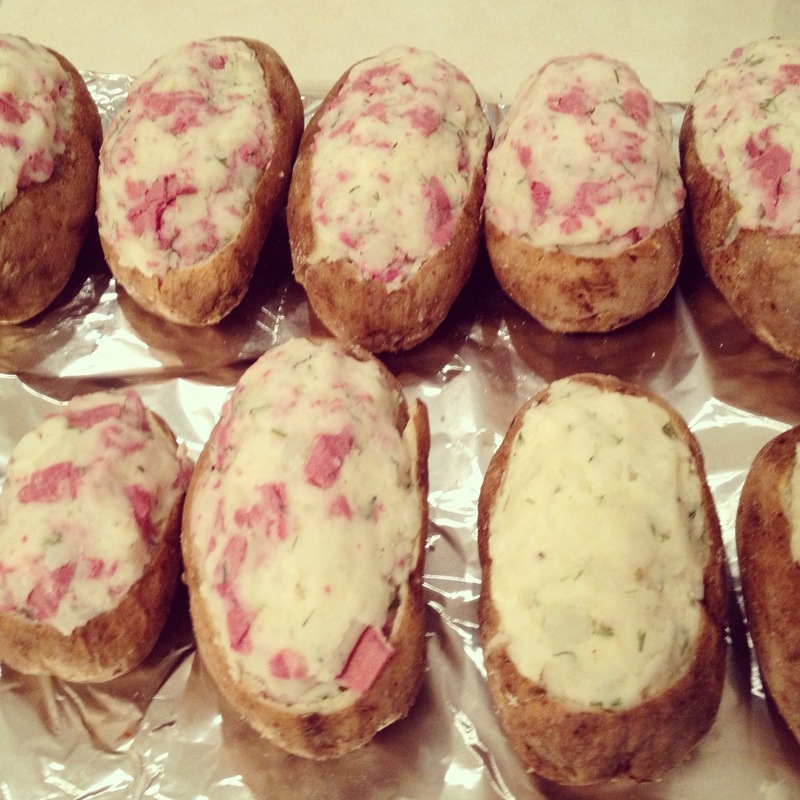 I asked my dinner guests to give me their honest opinion on the corned beef potatoes, since I had to write about them as honestly as possible without firsthand knowledge, and they promised they were delicious and blog worthy, so here you go. I’m really going to branch out and start writing about recipes from something other than my favorite cookbook soon, but I think this one is timely enough that it warrants being my fourth Melissa Clark recipe in as many weeks. 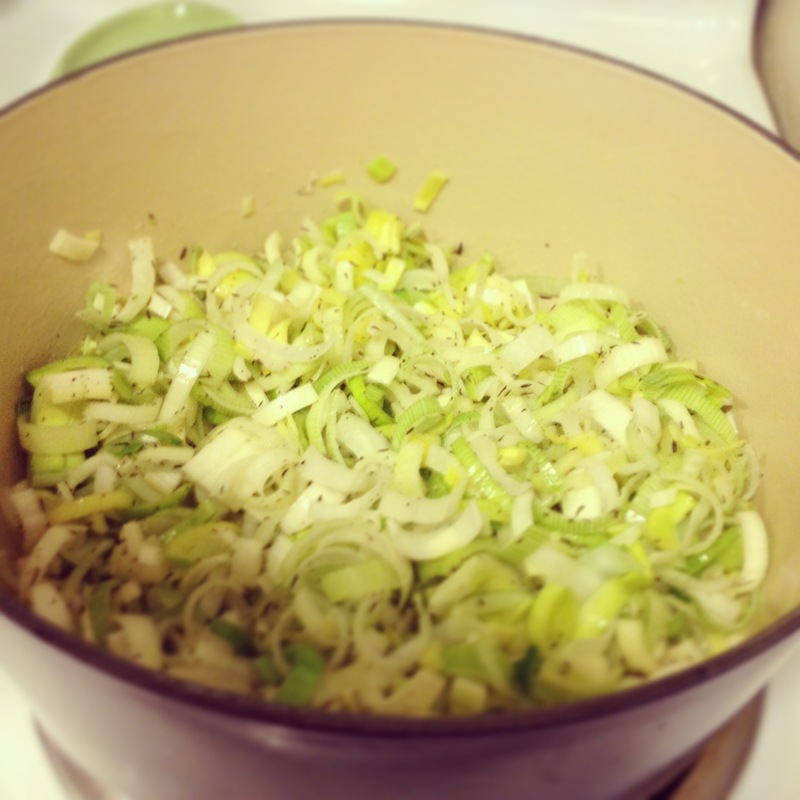 I had mentioned to a couple friends awhile ago that I wanted to get through the entire “March” chapter, but that I was stuck on corned beef and cabbage – it sounds like my worst nightmare, so why would I ever make it. But when they both told me they loved corned beef and would be happy to be my taste testers, we decided to throw a little St. Patrick’s Day get together. The two best things about this recipe, in my opinion: (1) the corned beef it calls for is deli meat, so I didn’t have to cook it, and (2) it’s easy to make a vegetarian version if you, like me, like to cook meals your friends can enjoy even if they’re things you can’t eat. 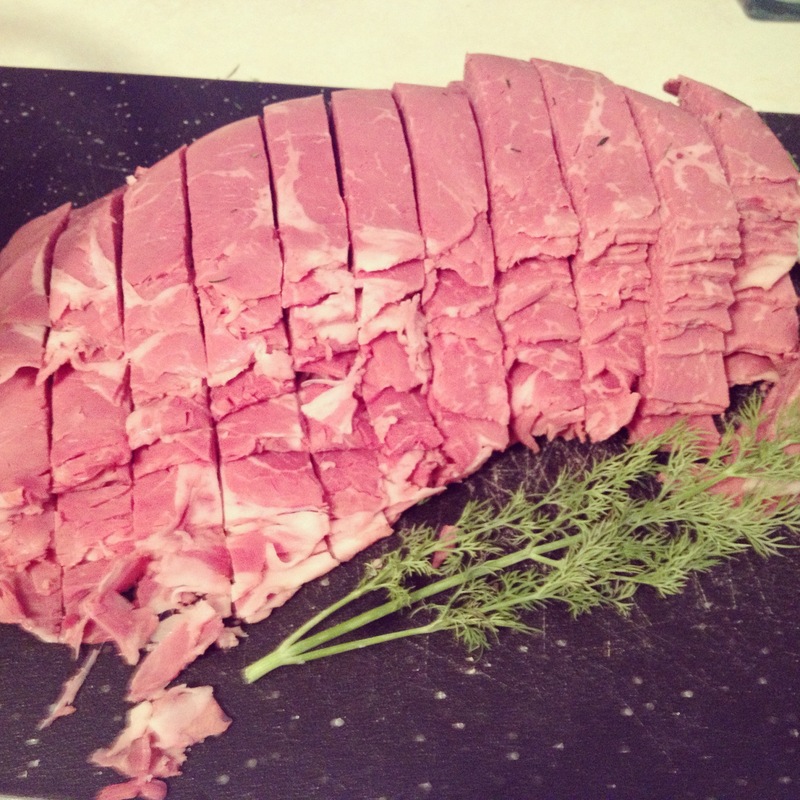 If you can’t find deli corned beef, though (I couldn’t find it at Safeway or Met Market, but luckily my co-hostess found it at QFC), you could do a corned beef brisket in the crock pot, or use any other deli meat or leftover roast-type meat. And although the vegetarian version is just a stuffed potato with butter and dill, I thought it was delicious and still very Irish. A note for people unfamiliar with the traditional corned beef and cabbage recipe: from what I could garner from my limited research, it seems the corned beef and cabbage are usually cooked together, in a crock pot or dutch oven or something along those lines. I saw a Paula Deen recipe where she sautéed the cabbage in bacon grease and then added corned beef from a can, like spam. Excuse me while I vomit. 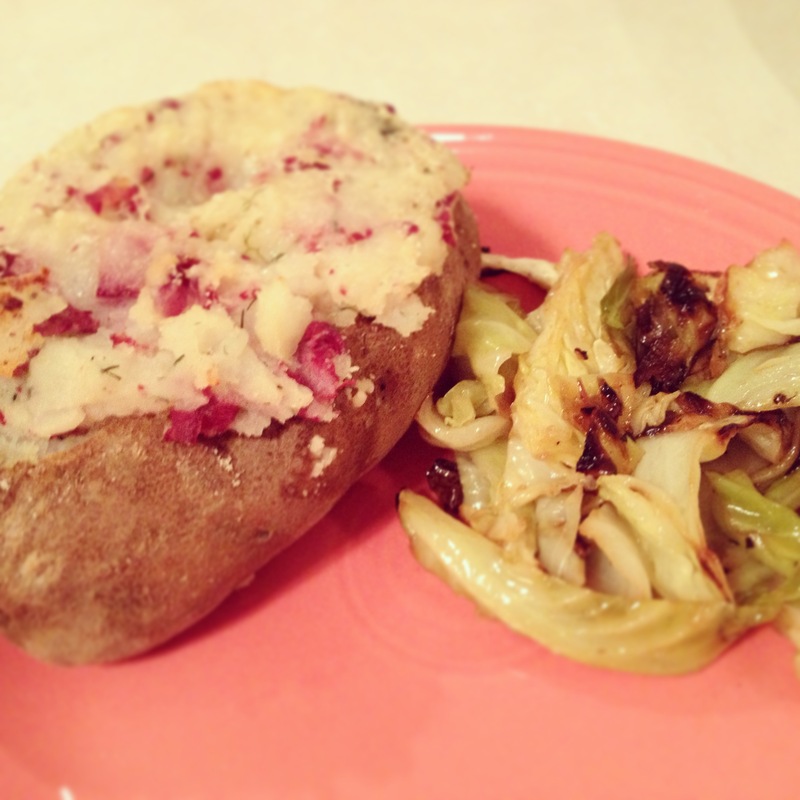 I like this recipe because it’s essentially a doctored-up twice baked potato (yum) – I baked the potatoes the night before, but then was able to get everything else together in the hour between leaving work and my guests arriving. 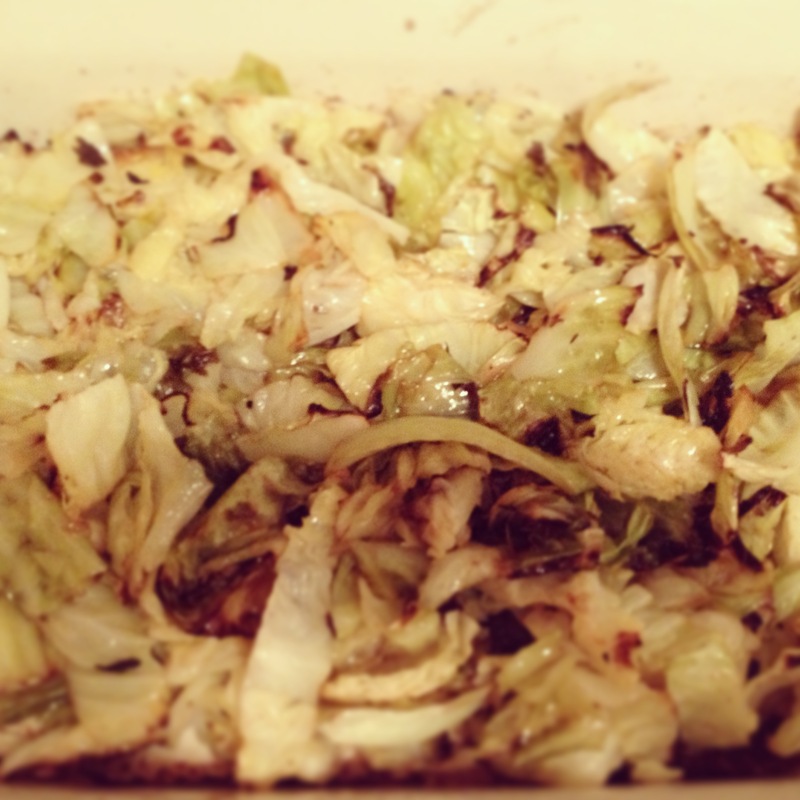 And you roast the cabbage as you would any other vegetable (the recipe just calls for oil and salt – I used black pepper as well, and was planning to add a little parmesan before I got distracted and forgot). So, if you’re looking for an excuse to throw an easy St. Patrick’s Day party, just ask your friends to bring their drink of choice, and perhaps an app or a dessert (my friend Liza made the most delicious “Irish Car Bomb” cupcakes, and my friend Anna invented a fabulous green cocktail, recipe available upon request) and you could easily whip up corned beef and cabbage for ten in an hour. Also noteworthy: I think I spent less than $40 on all of the ingredients (to feed ten people!!) 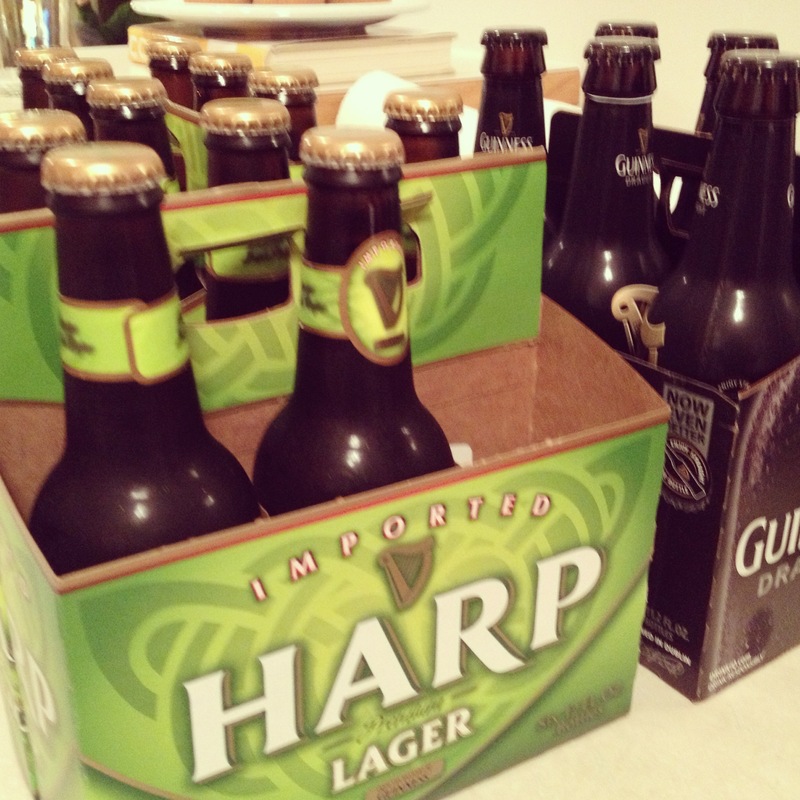 – the Irish might not be known for their cuisine, but I do appreciate their frugality. 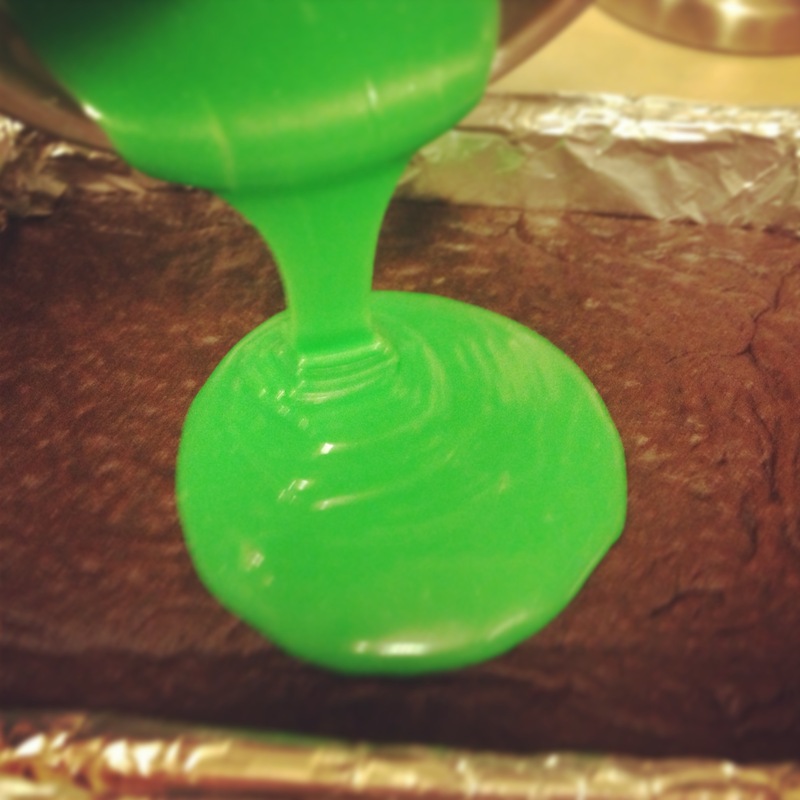 And although our meal was delicious, it’s not all that visually appealing…..so I thought I would make some festive green brownies too. I’ve been waiting for an excuse to make these ever since I stumbled upon them when looking for Christmas cookie ideas back in December, and obviously St. Patrick’s Day is the best excuse possible. I hope this inspires some of you to throw a St. Patty’s day party of your own – or at least treat yourself to a Guinness or a fun green cocktail sometime between now and the 17th! 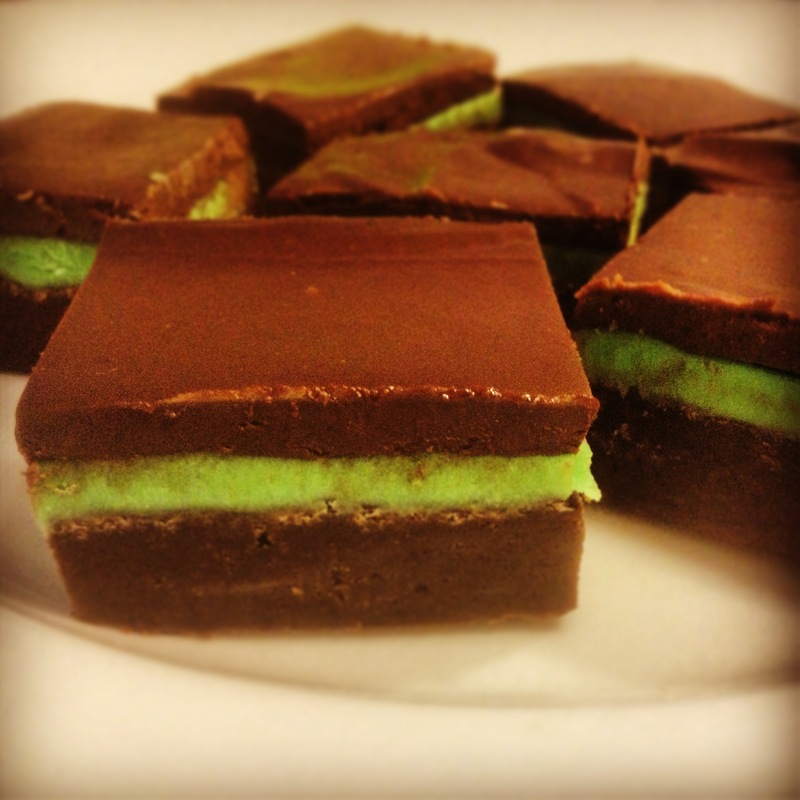 If you have any St. Patty’s recipes or traditions of your own, I would love to hear them in the comments! 1. 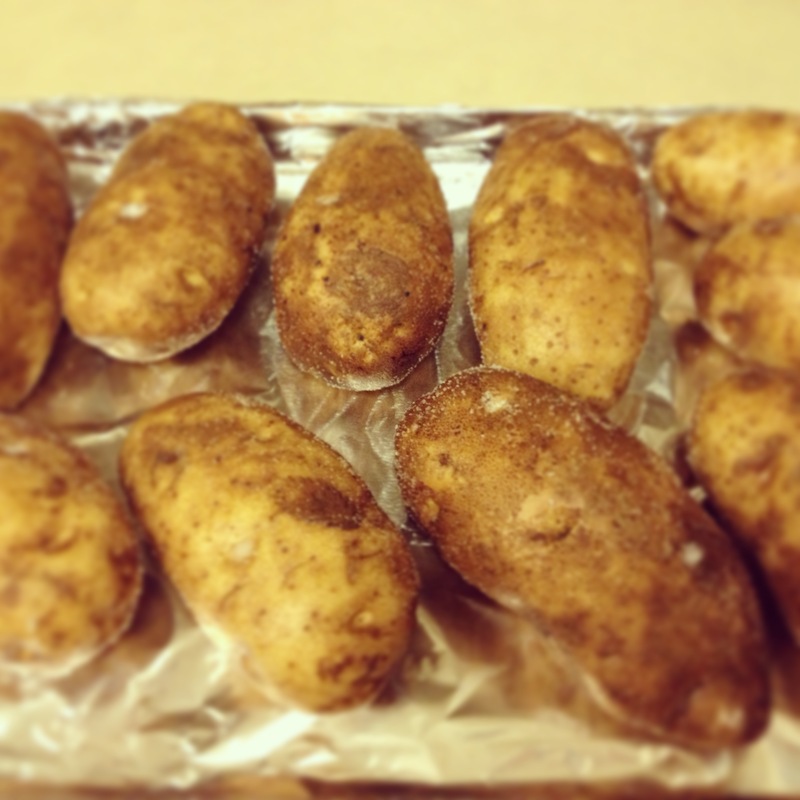 Preheat oven to 425 degrees F. Rub each potato with 1/2 teaspoon salt and pierce twice with a fork. Place the potatoes on a baking sheet and bake until the skin is crispy and the insides are tender when pierced with a fork, 1 hour to 70 minutes (possibly longer if you’re cooking more potatoes). 2. When the potatoes have cooled enough to handle, use a sharp knife to slice off the tops. Scoop out the insides, leaving about 1/4 inch attached to the skin, and transfer to a bowl. 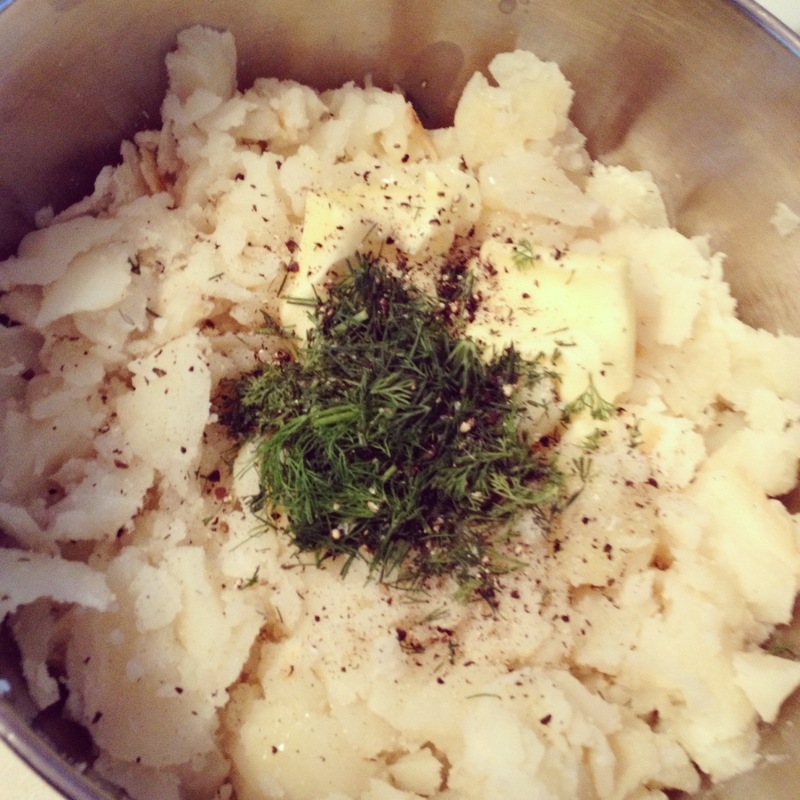 Add the corned beef, butter, dill, remaining salt, and pepper to the bowl and mash well with a fork. 3. Stuff the potato skins with the potato mixture. Divide the topping among the potatoes and sprinkle with the cheese. Return the potatoes to the oven and bake until heated through, about 10 minutes. Run under the broiler for an additional 1-2 minutes, until golden brown and the cheese has melted. 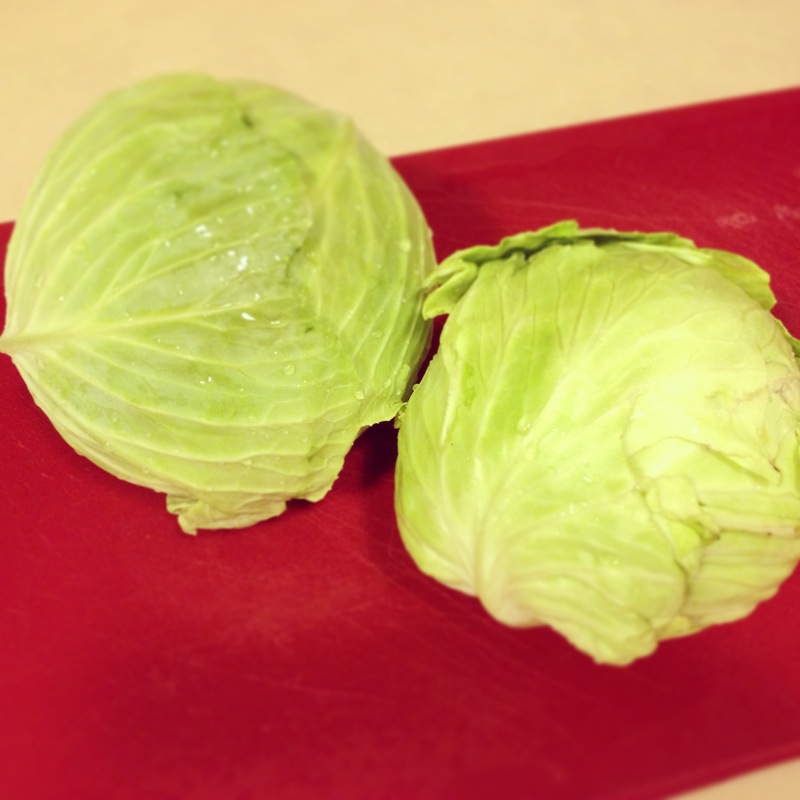 Preheat the oven to 400 degrees F. Cut the cabbage into 1-inch-thick slices. Brush the slices with olive or peanut oil and place on a rimmed baking sheet. Try to keep the pieces from falling apart (though if they do start to separate, that is okay). 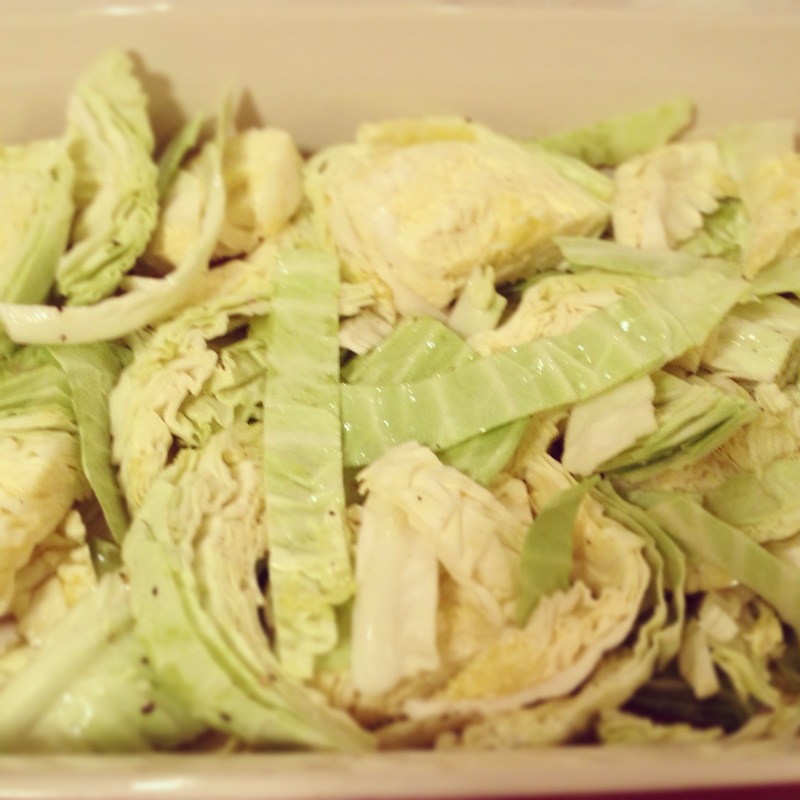 Sprinkle the cabbage with a generous seasoning of salt. Roast, turning once, until crispy and browned, 25 to 30 minutes. I found these cute little ceramic markers while I was out shopping this weekend and they motivated me to start thinking about replanting my herb “garden” (pots). I was really good about planting the basics last year (basil, rosemary, thyme, oregano, Italian parsley), and it was so great to be able to just pop out onto the deck whenever I needed something for cooking (or cocktails). It might still be a little to cold to plant anything yet, but that doesn’t mean I can’t shop for garden accessories. 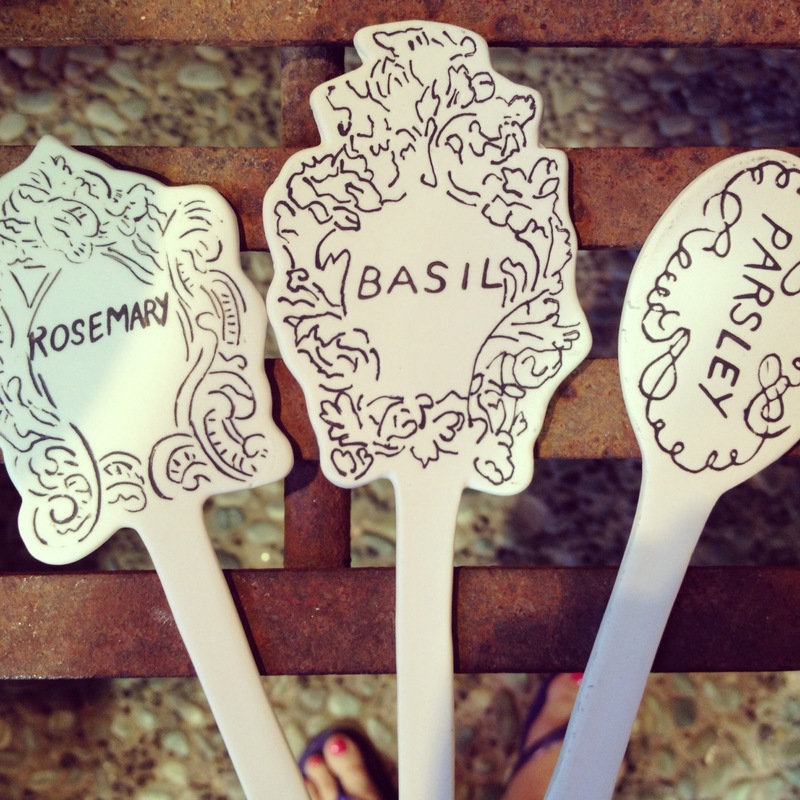 These vintage silverware ones (I’ve seen them at Nordstrom, Anthropologie, Etsy – all over, really) are pretty cute too. And don’t even get me started on the planters/pots that are on display everywhere – luckily I have limited space, or I could really do some damage. Tonight my friend Krista and I are throwing a mini-dinner party for some friends, mainly as an excuse to make Corned Beef and Cabbage (recipes coming Monday – get excited:)) for an early St. Patrick’s Day celebration. 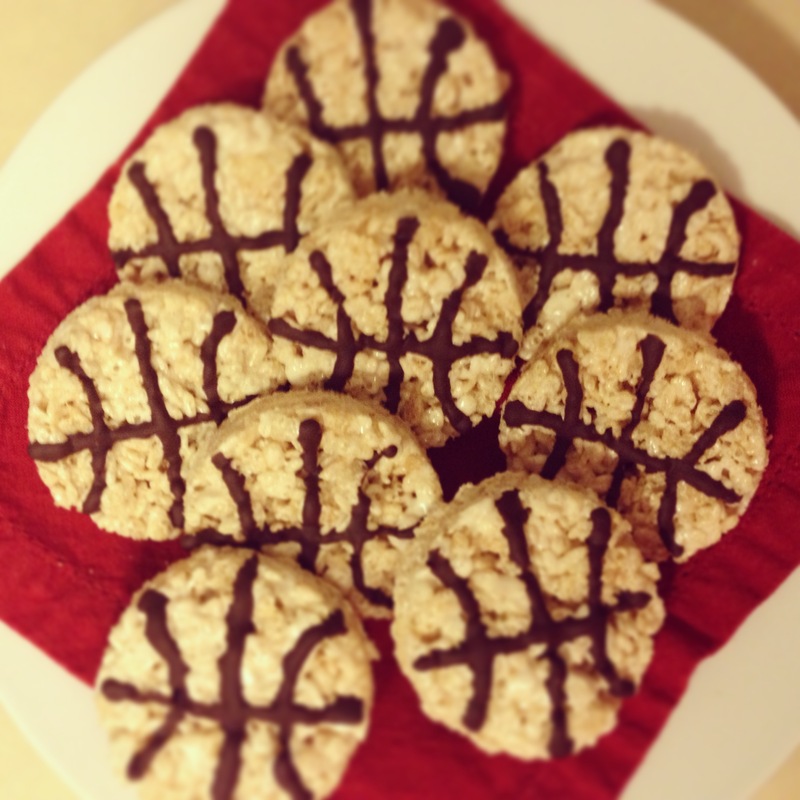 I saw these on Pinterest, and thought they would be a fun dessert for the kids that are coming to dinner. 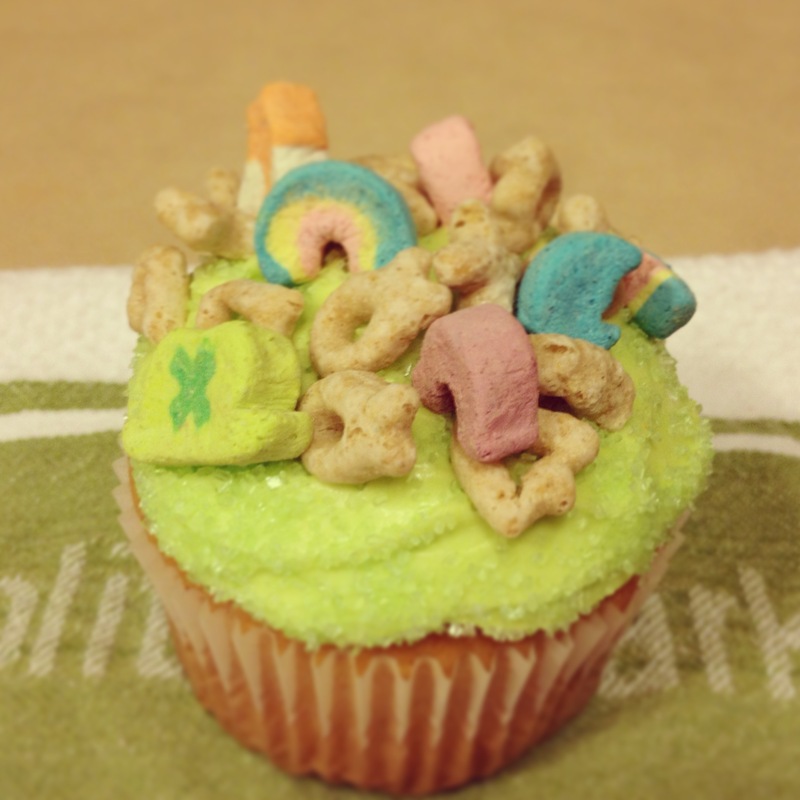 Super easy – my friend Jenn once gave me the invaluable tip that you can always use a cake mix for cupcakes, so long as you make homemade frosting (I love this recipe) – and who doesn’t love Lucky Charms? I bought this coconut macaroon candle on a whim the other day, and it makes me so happy to light it as soon as I get home each night. 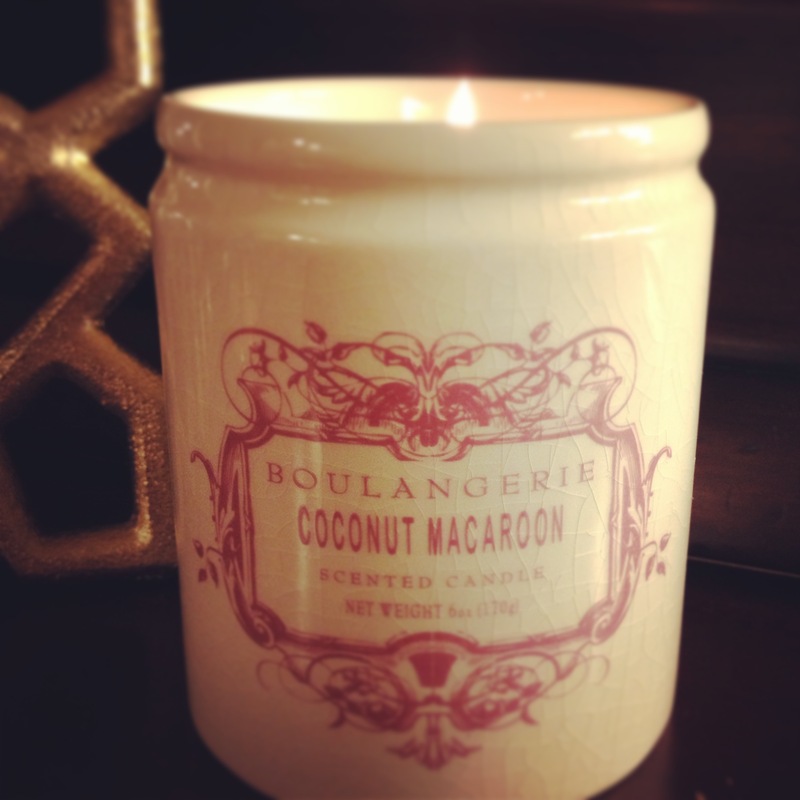 The coconut scent reminds me of Easter and Hawaii and cookies and all sorts of yummy things – and it’s about half the price of most of the candles at Anthro, so should you find yourself in need of a great hostess gift, this would be it! I’ve been making a big effort lately to make myself a healthy smoothie for breakfast -starting out the day with protein, vitamins and minerals, fruits and veggies, etc. I usually just do almond milk, frozen berries, and my favorite protein powder (which includes powdered kale, woop! 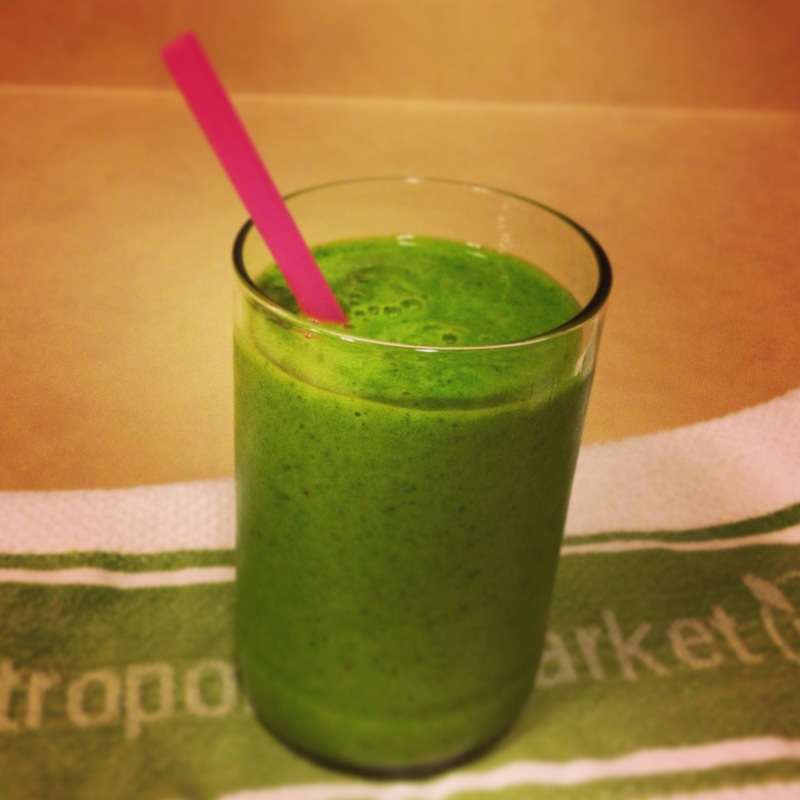 ), but with all the buzz about green smoothies these days, this week I’ve been trying to do that instead. I used this recipe (she gives you two, I kind of do a combination of both), and it really is true that you can’t taste the spinach (or kale). While you will never hear me telling anyone to give up coffee, there really is something to be said for starting your morning with a big glass of greens. And it’s that much easier to ignore the pastry case at Starbucks when you go get your coffee afterwards. Remember the muffins I talked about on Monday? I made them again – a healthier version this time – and they were SO good. Better than the original, IMHO. I just substituted 7 Tbsp coconut oil for the butter, and in lieu of 1.5 cups white flour I used 1/2 cup white flour, 1/3 cup whole wheat flour, 1/3 cup oat flour, and 1/3 cup almond meal. You could use whatever blend of flours you like, and while the heavier flours/meals make the muffin a little more dense, they give the muffin an oatmeal/nutty flavor that made them even more delicious than the white flour version. I also used brown sugar in place of 1/2 cup of the white sugar (using 1/2 cup brown and 1/4 cup white rather than all 3/4 cup white – and they were still pretty sweet, so I think you could leave out the white sugar altogether if you wanted). I omitted the crumble topping, threw in a little coconut with the blueberries, and the result was something that, while no green smoothie, is far more passable as breakfast than the sweeter version I made earlier. Healthy and delicious! Have a great weekend, everyone! I hope it’s filled with sunshine and college basketball!